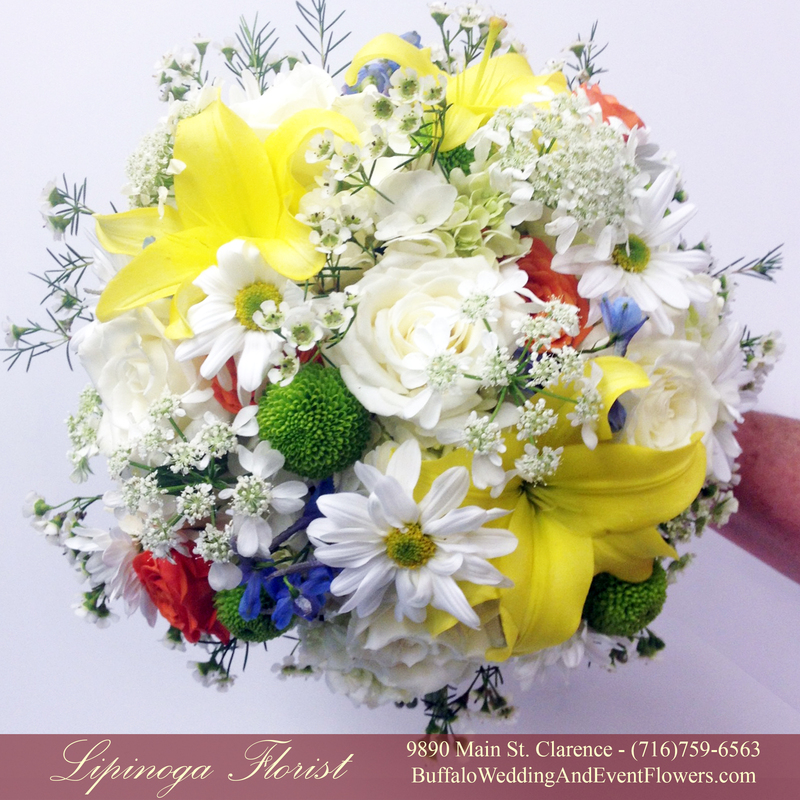 The Bridal bouquet included a colorful mix of summer flowers combined with beautiful bridal white blossoms. 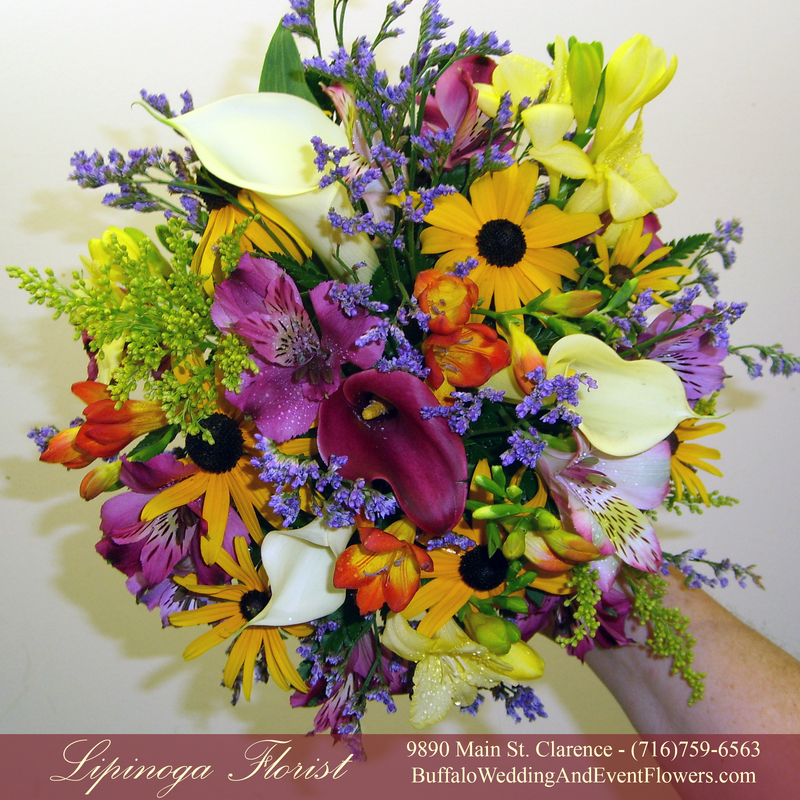 The Bridesmaids bouquets were also a very casual wildflower mix including more vibrant hues. 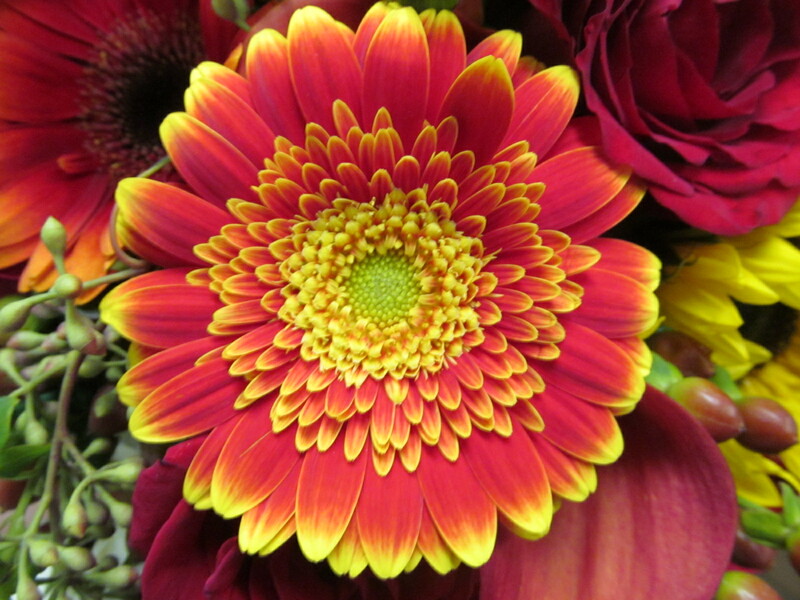 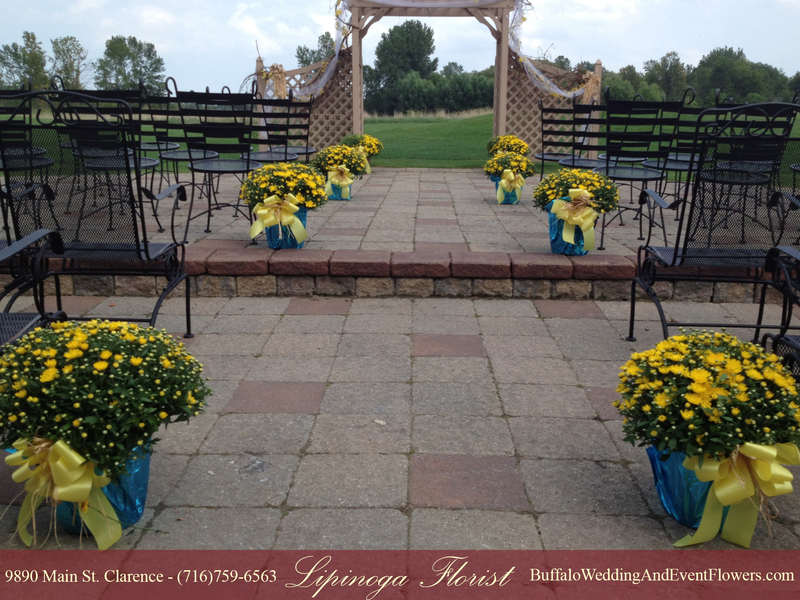 The ceremony was bursting with color with beautiful, bright, yellow mums accented by turquoise. 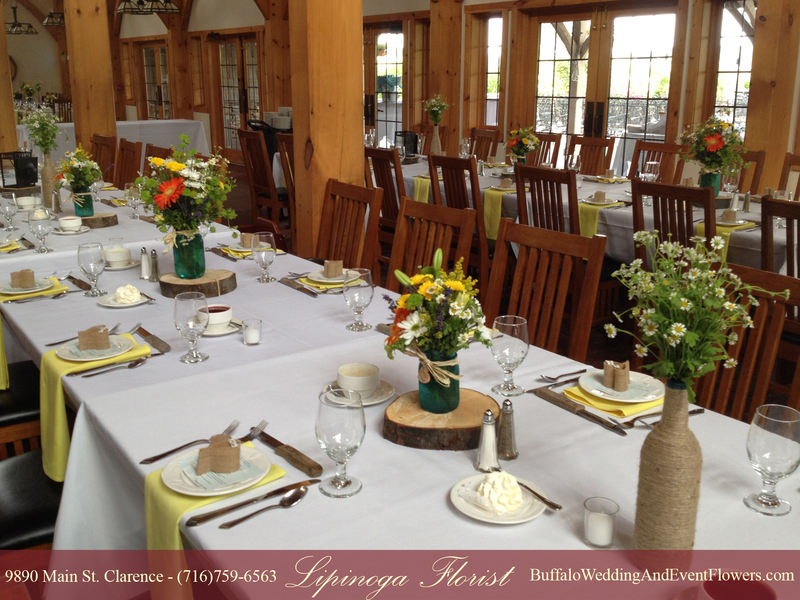 The reception held at The Timberlodge in Akron, NY featured long dining tables lined with alternating arrangements of assorted wildflowers. 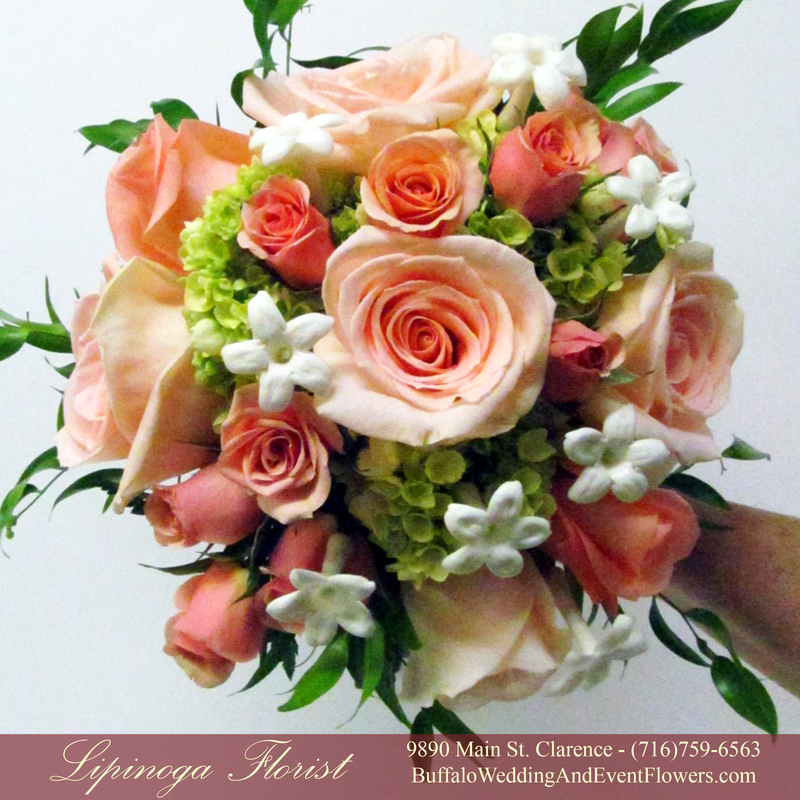 Casual yet chic boutonnieres included flowers to complement the bridal bouquets and decor. 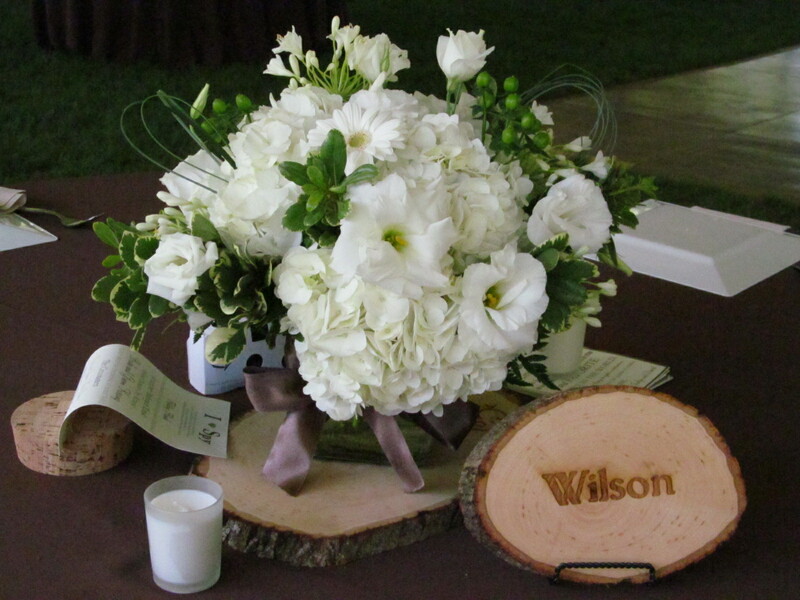 The groom wore a classic white rose dressed up with country chic charm. 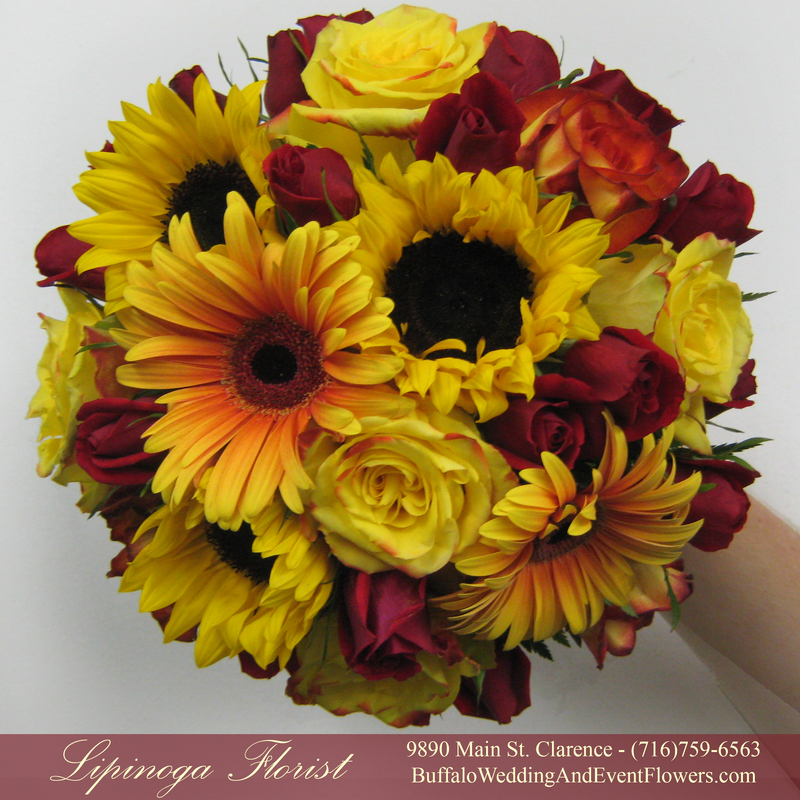 The groomsmen wore yellow gerbera daisies and the fathers wore white gerbera daisies to complement. 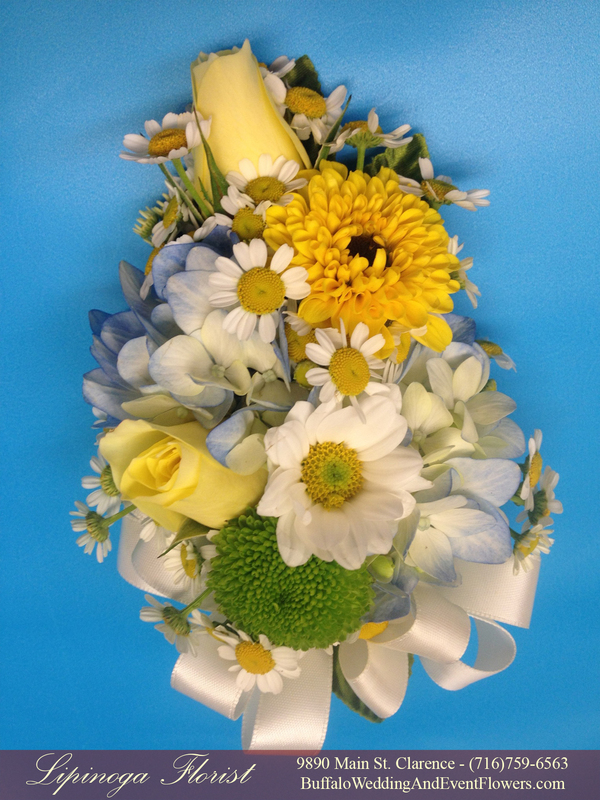 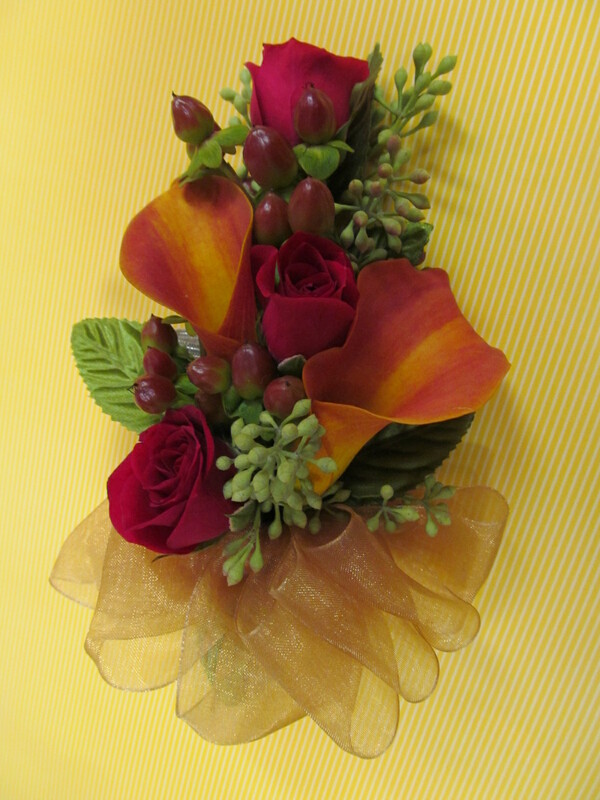 A combination of wildflowers was made into a simply charming corsage for the mothers and grandmothers. 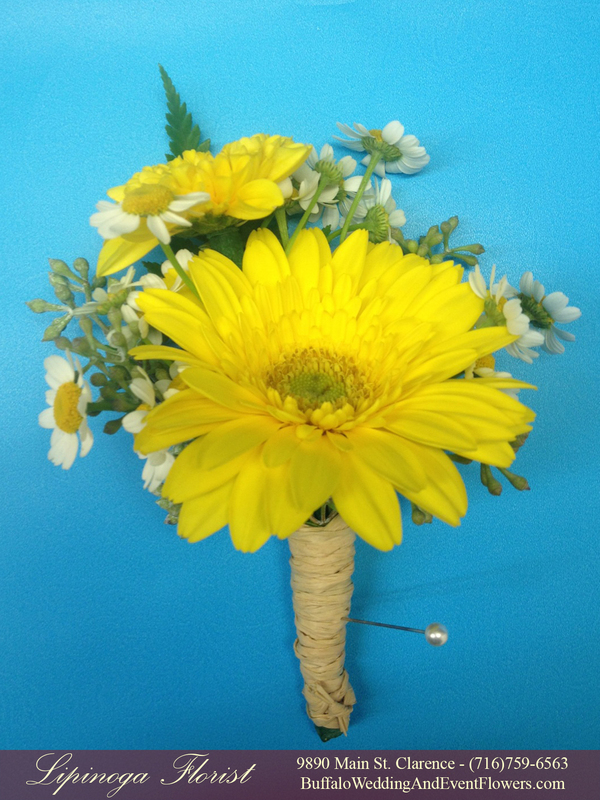 All of the boutonnieres were wrapped in raffia following through with the raffia wrap on the centerpieces. 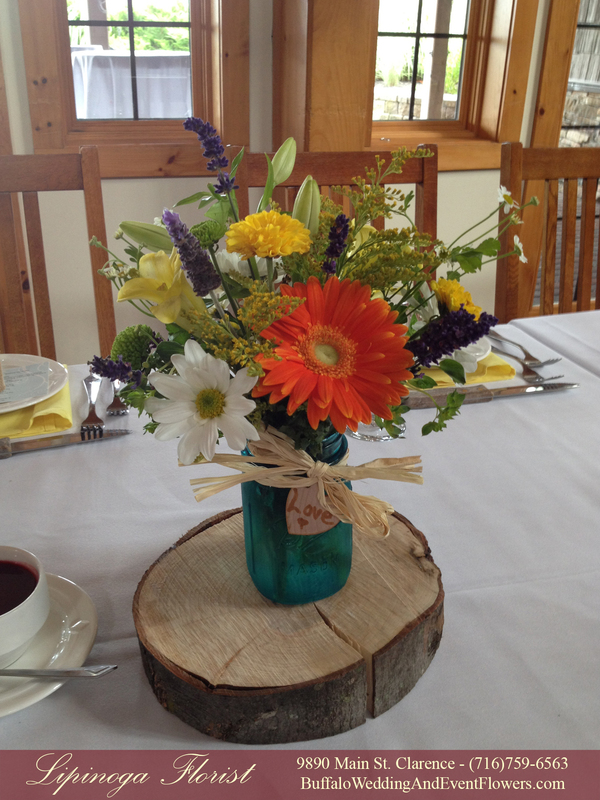 Turquoise mason jars were filled with an assortment of colorful wildflowers and then tied with a charming raffia bow. 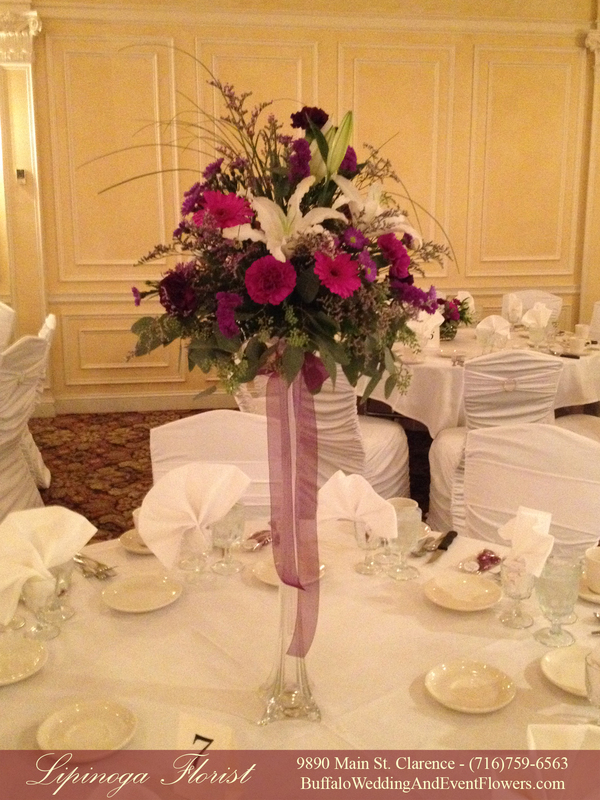 Purple, Plum, Lavender and White Flowers accented the traditional yet elegant setting for this wedding held at Samuel’s Grand Manor in Williamsville, NY. 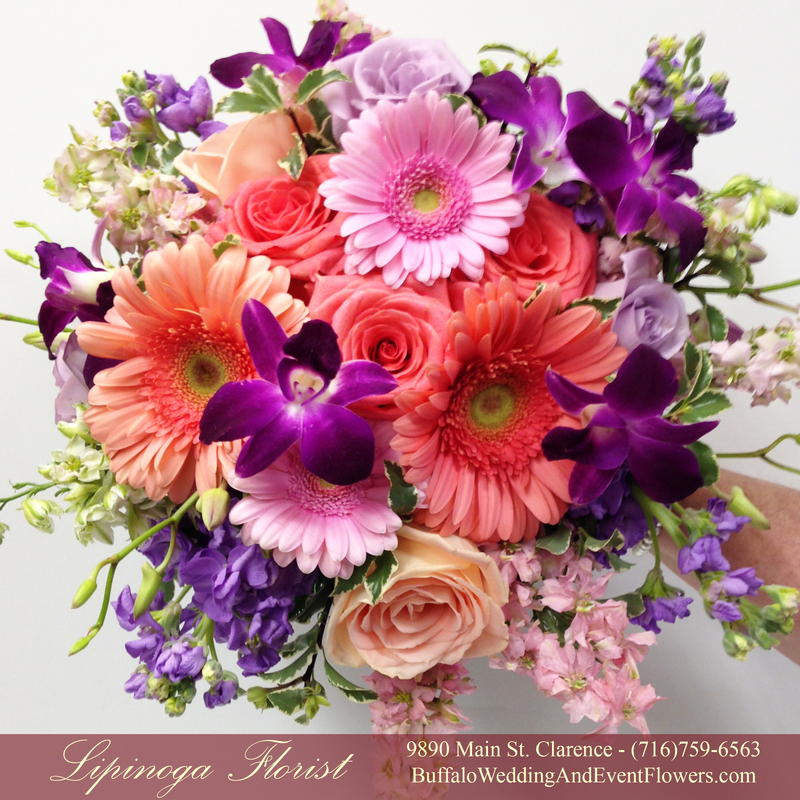 The design team at Lipinoga Florist created beautiful arrangements including a variety of flowers such as lilies, gerbera daisies, hydrangea and orchids. 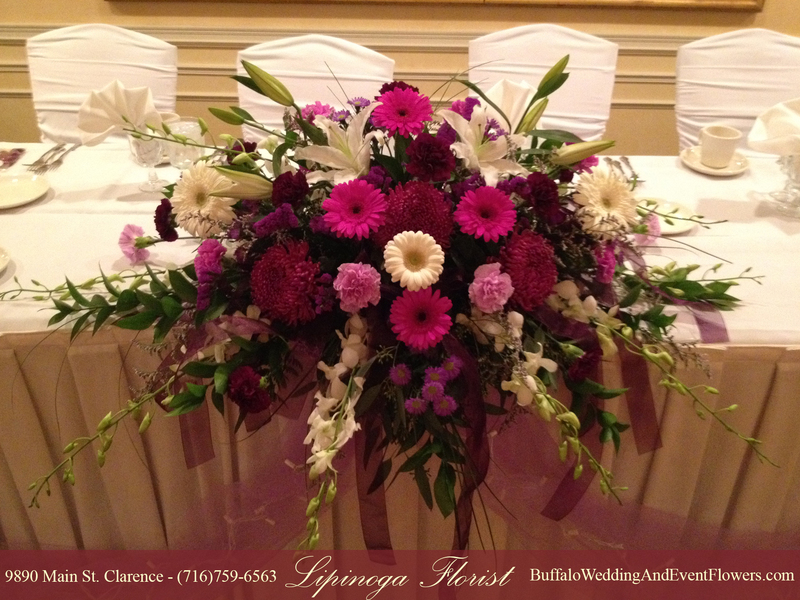 Tall eiffel tower vases adorned with a stunning display of Casablanca lilies, purple gerbera daisies, assorted greenery and purple accent flowers were tied with a soft sheer plum ribbon. 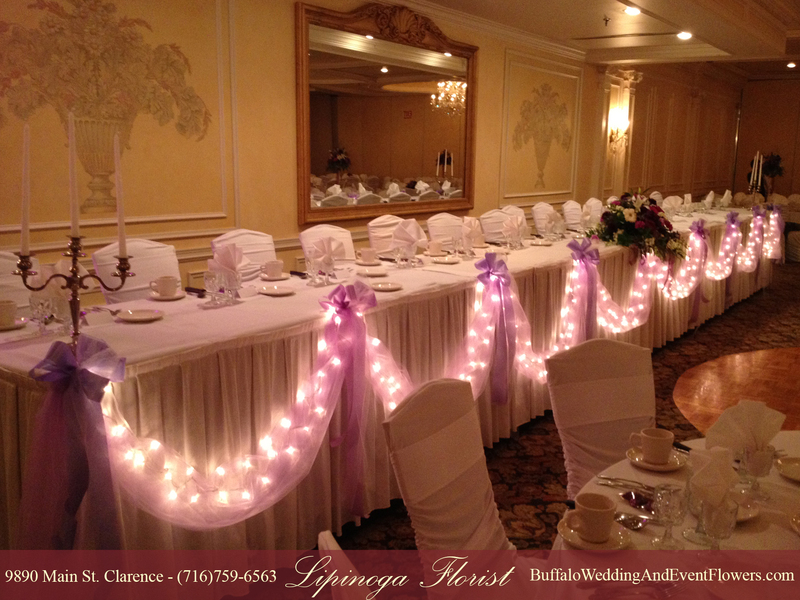 The design staff at Lipinoga created a gorgeous head table display including draping lavender tulle with accent lights. 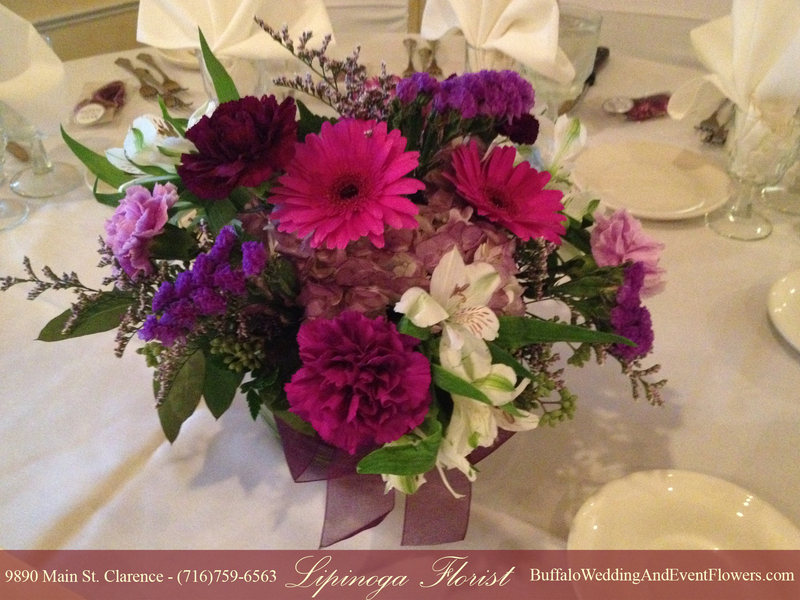 The head table centerpiece included flowers to complement the bouquets and centerpieces in coordinating purple hues. 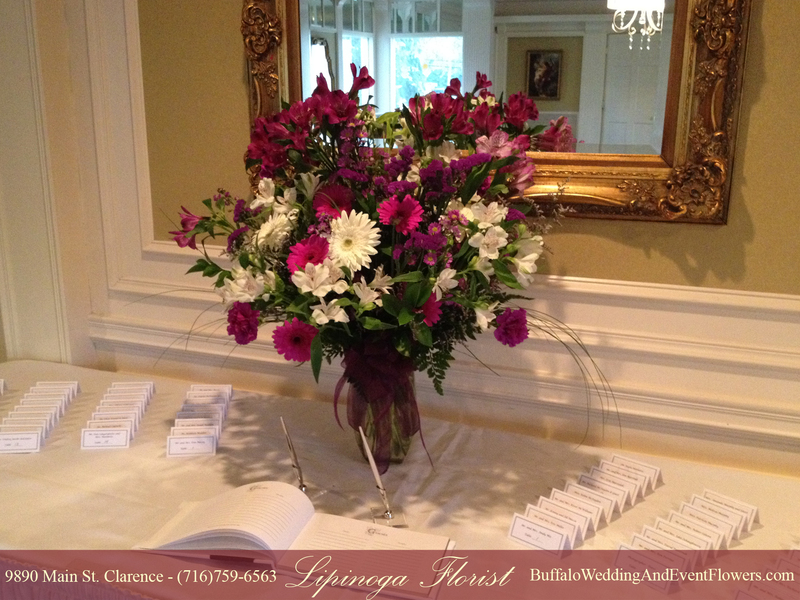 The entry table was accented by a stunning vase of complementary purple flowers. 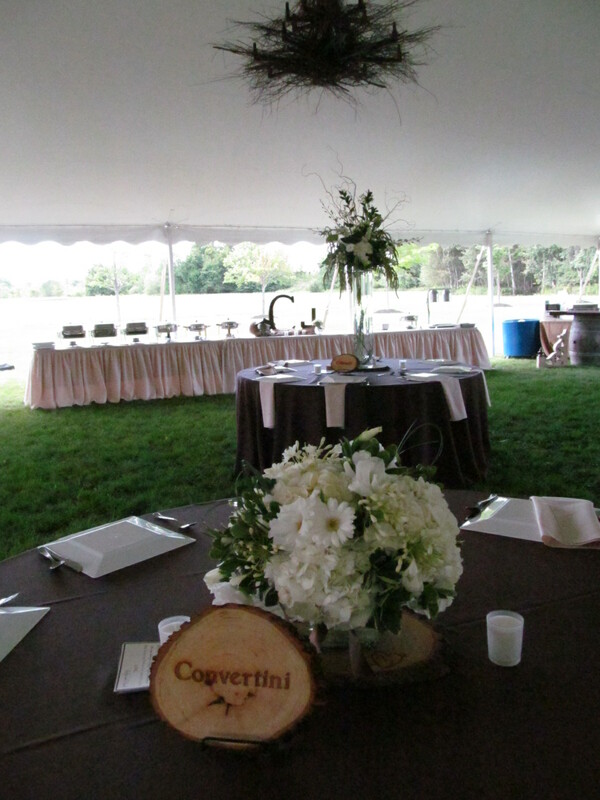 Half of the reception tables were adorned with lower centerpieces arranged in bubble bowls. 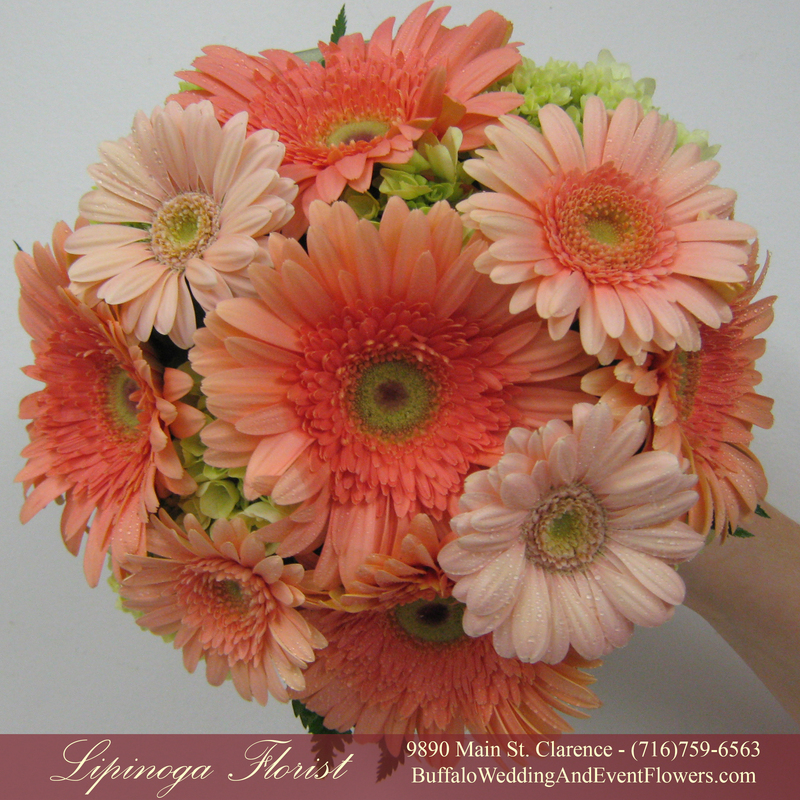 The combination of hydrangea, carnations and gerbera daisies created a beautiful display. 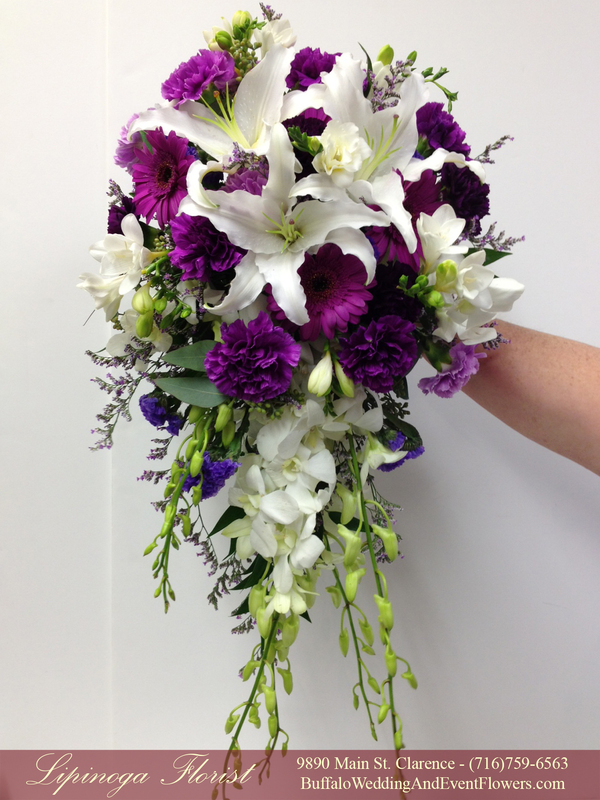 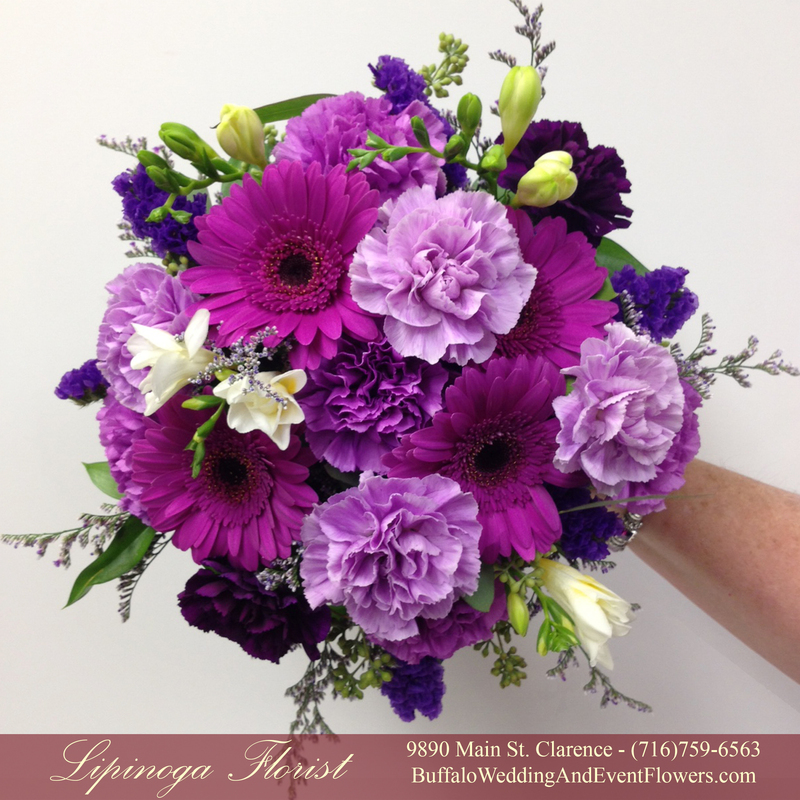 The bridesmaids carried round bouquets of carnations, gerbera daisies and freesia in shades of lavender, white, plum and purple. 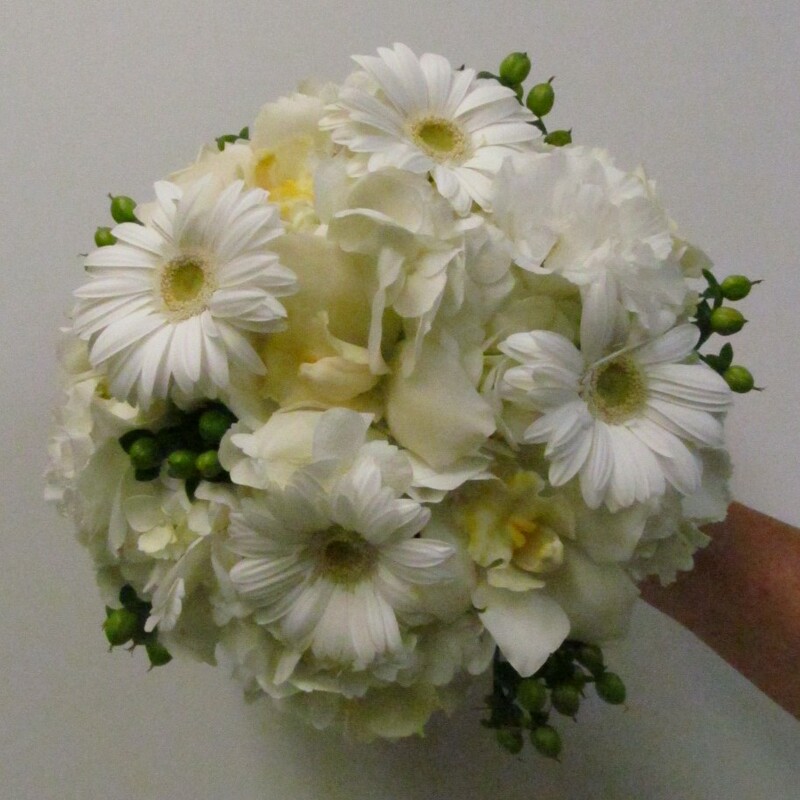 The maid of honor carried a bouquet that included more white flowers to differentiate herself from the rest of the bridal party. 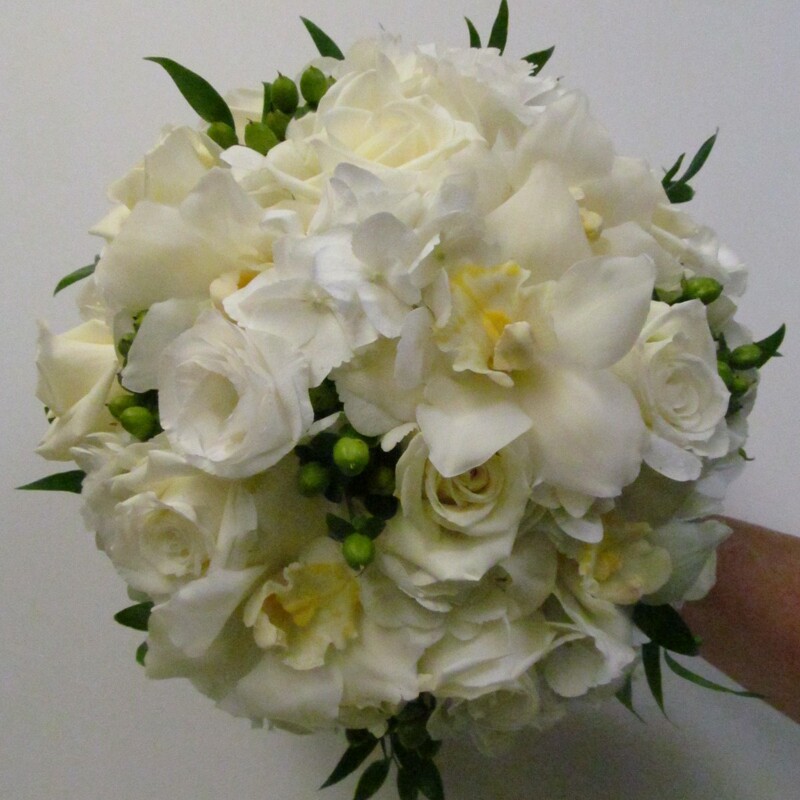 The bride carried a stunning cascade style bouquet with gorgeous casablanca lilies as a focal point and trailing white orchids. 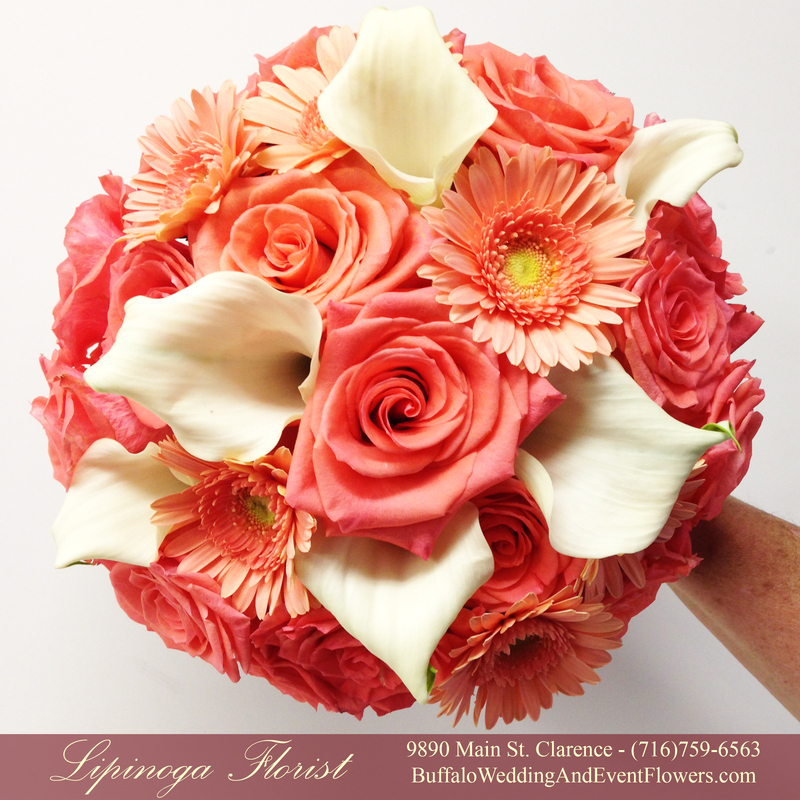 There is something so perfect about a pink wedding… and this wedding held at Brierwood Country Club in Hamburg, NY was no exception. 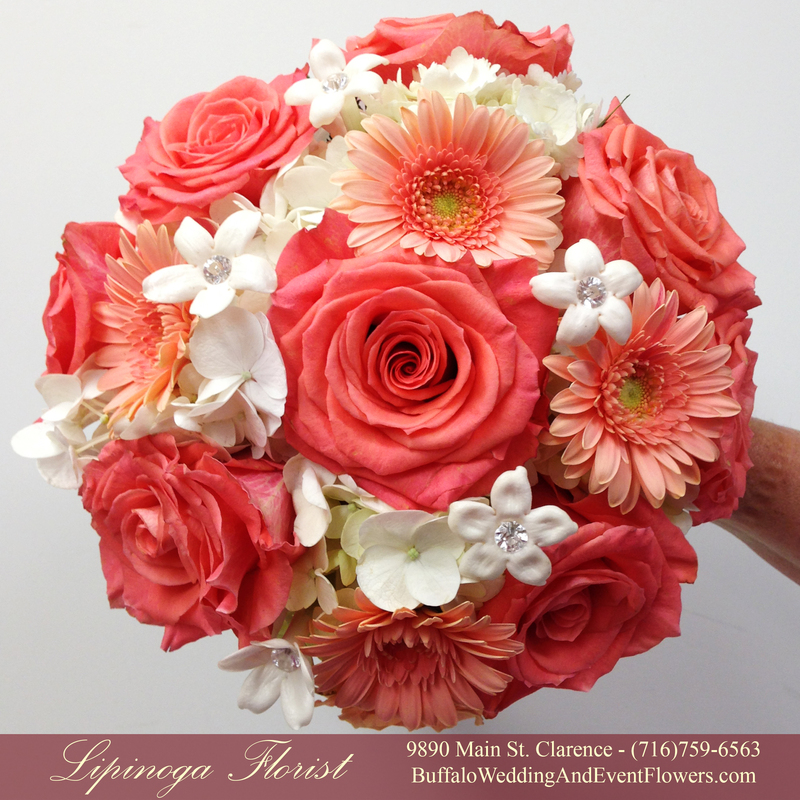 Hot Pink Blossoms popped against black accents. 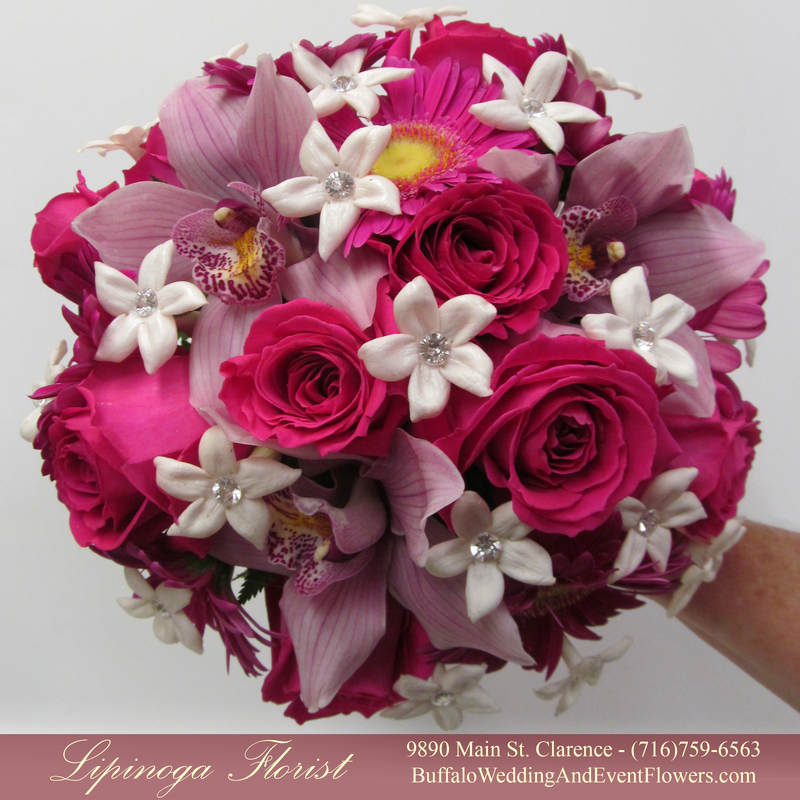 The Bride carried a classic bouquet of Hot Pink Roses, Hot Pink Gerbera Daisies, Orchids and Stephanotis with crystal accents. 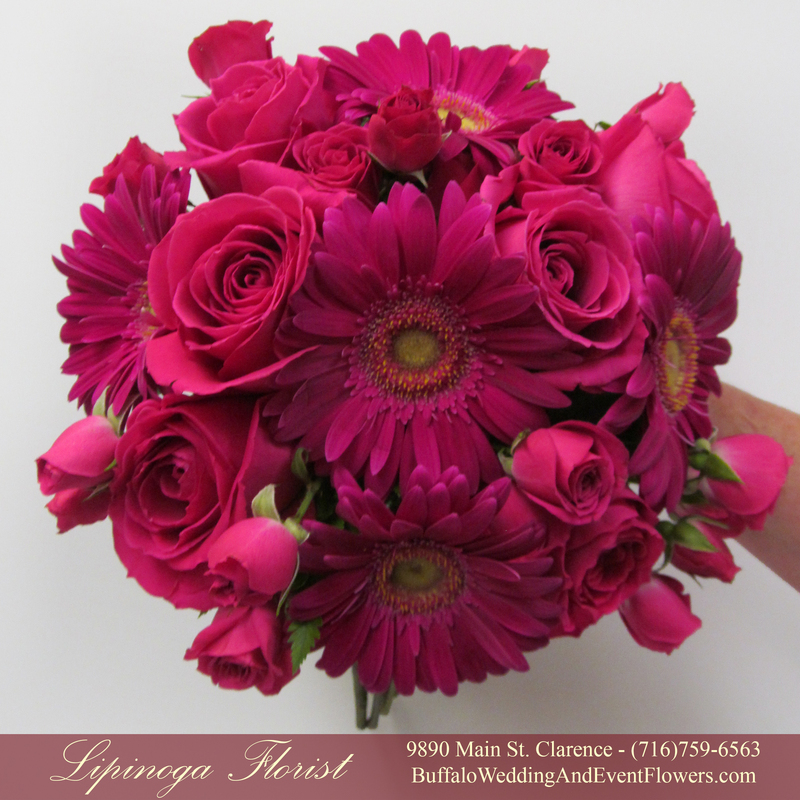 The Bridesmaids carried simple bouquets of all hot pink to pop against their black dresses. 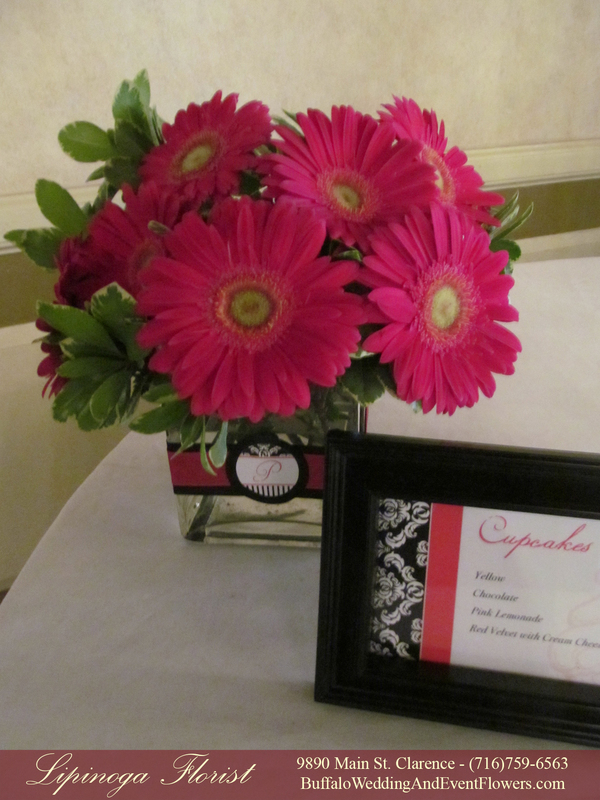 The placecard table featured a bouquet of gerbera daisies surrounded by hot pink rose petals. 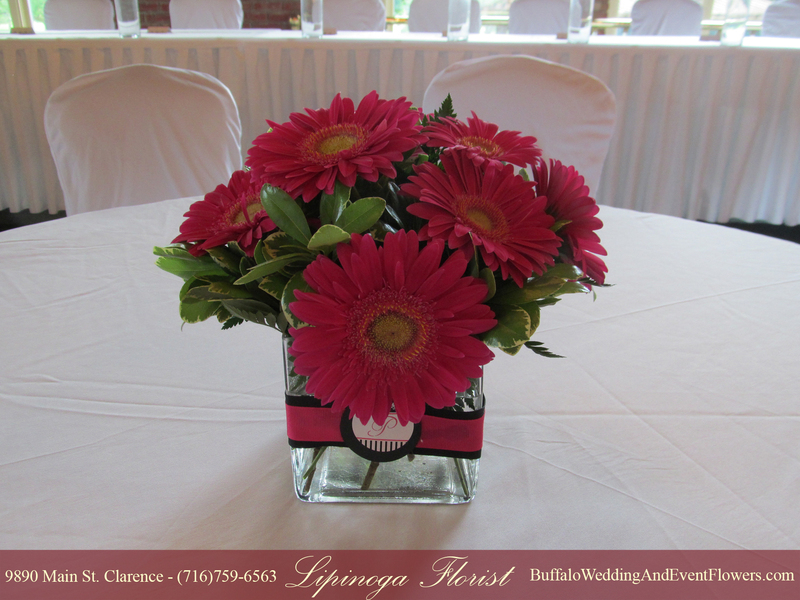 The centerpieces included hot pink gerbera daisies in a simple cube accented by black and hot pink ribbon and a monogram decal. 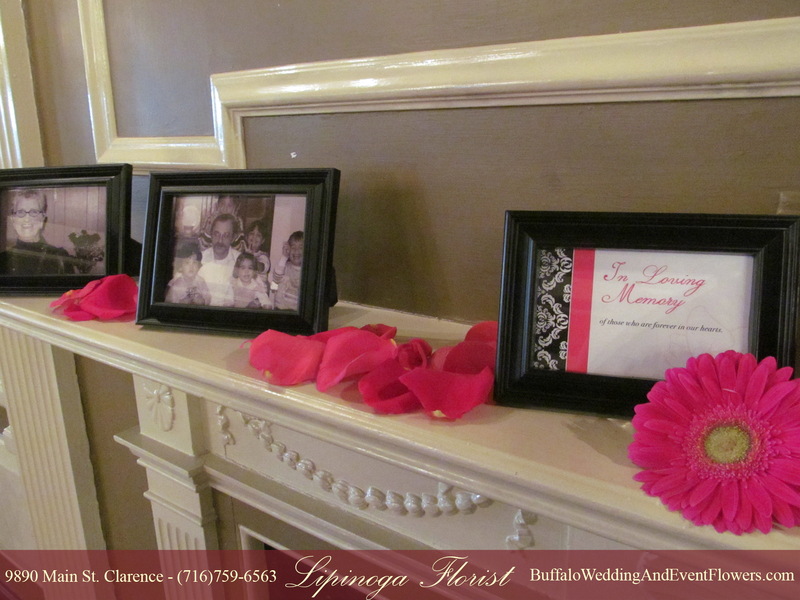 The mantle at Brierwood was turned into a memory display of photos of passed loved ones accented by touches of hot pink petals. 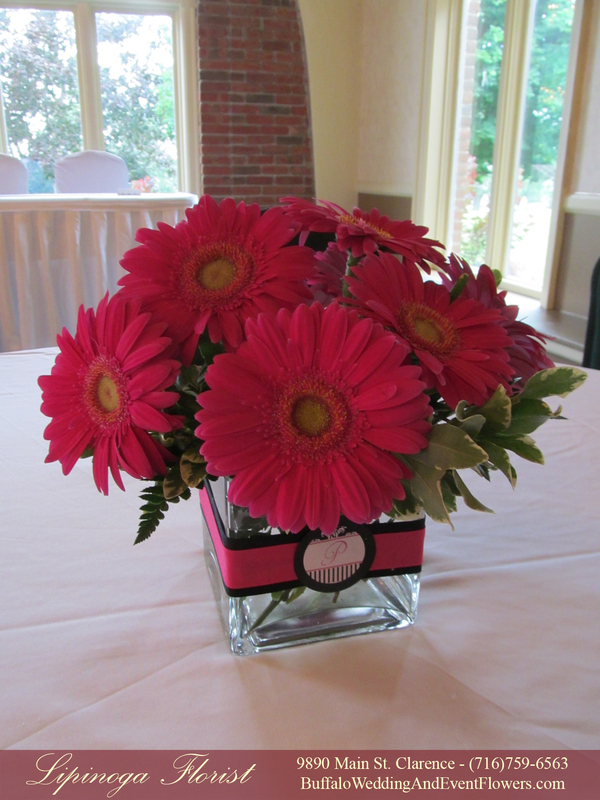 Flower arrangements of gerbera daisies created atmosphere on accent tables such as the cupcake table to tie the recepetion space together. 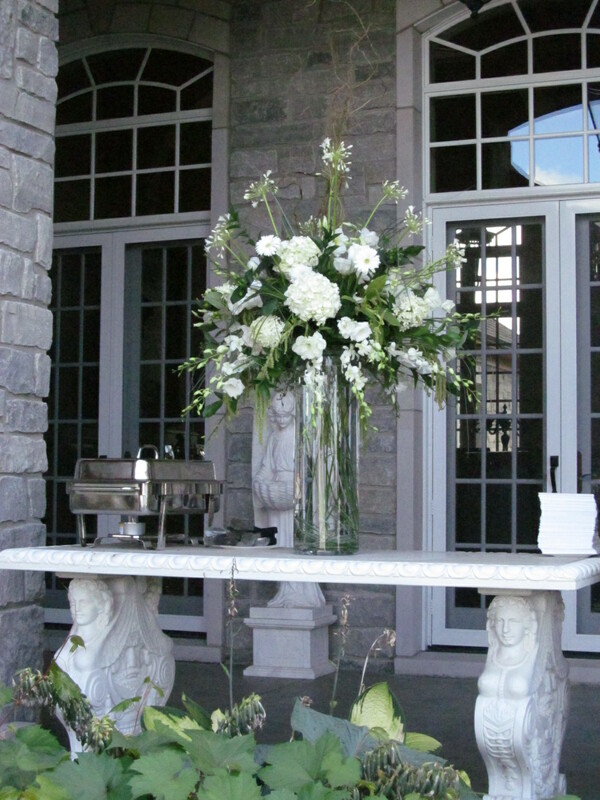 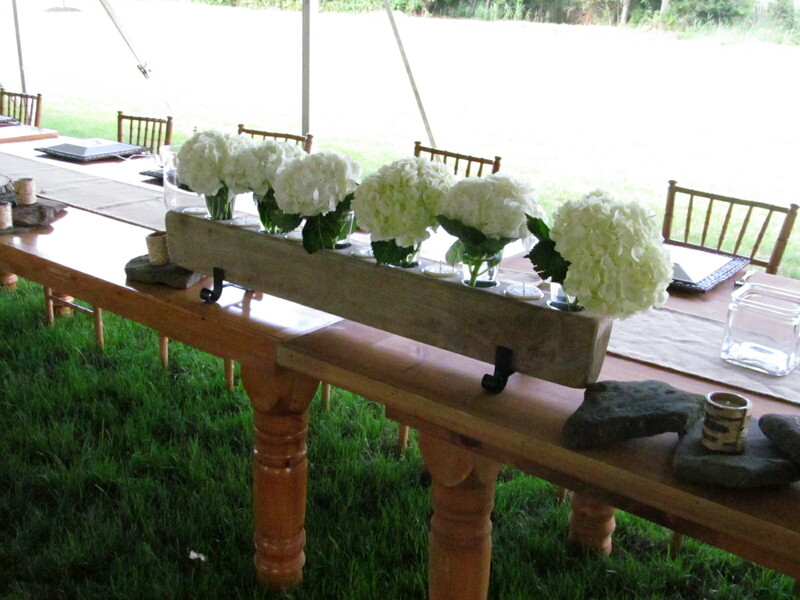 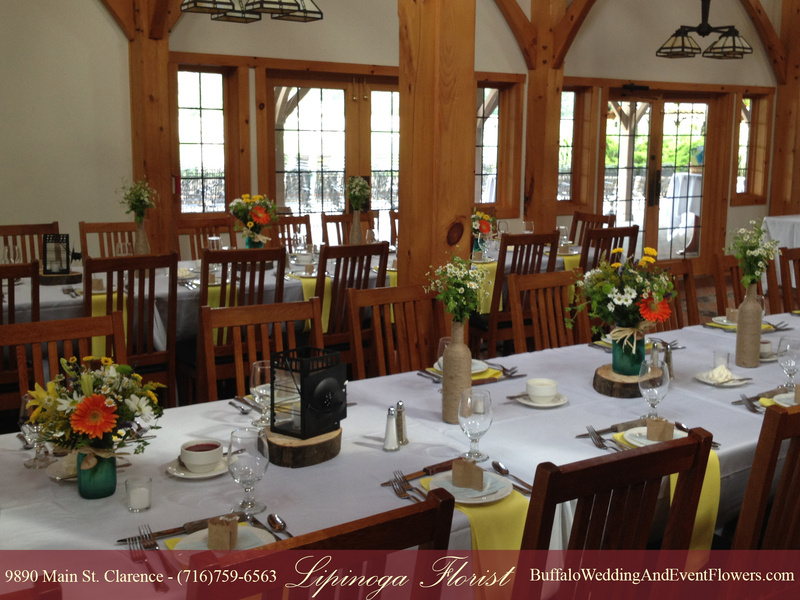 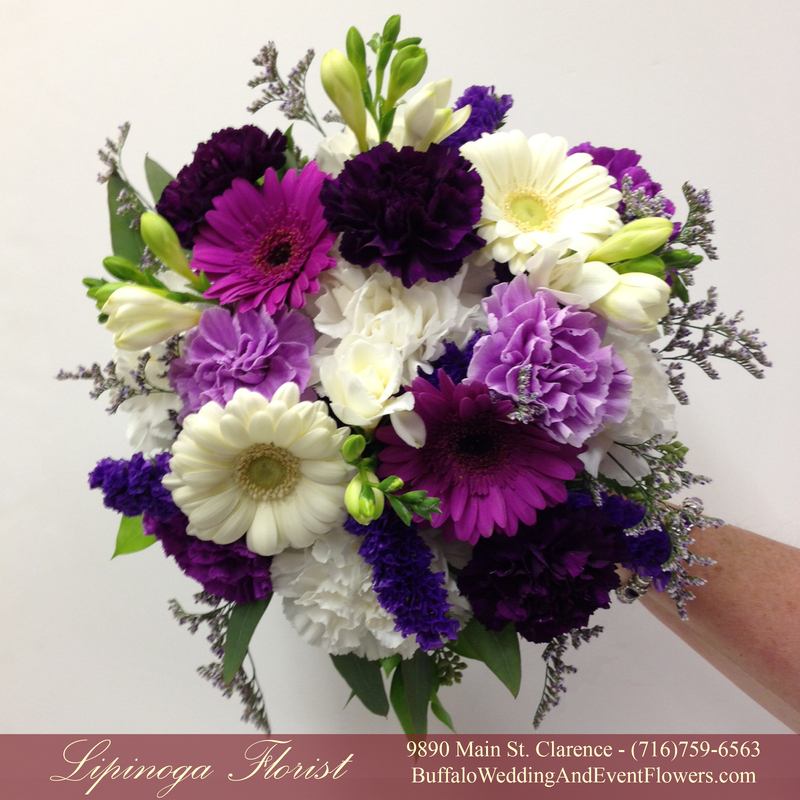 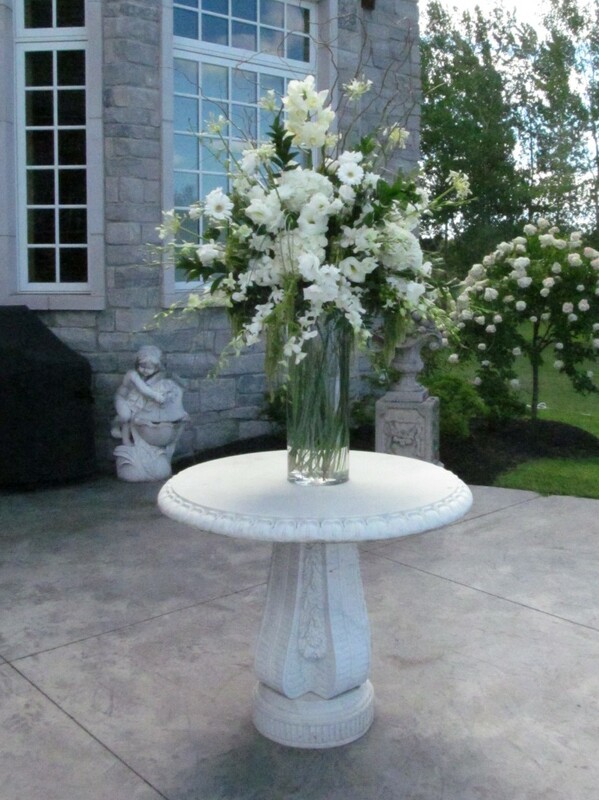 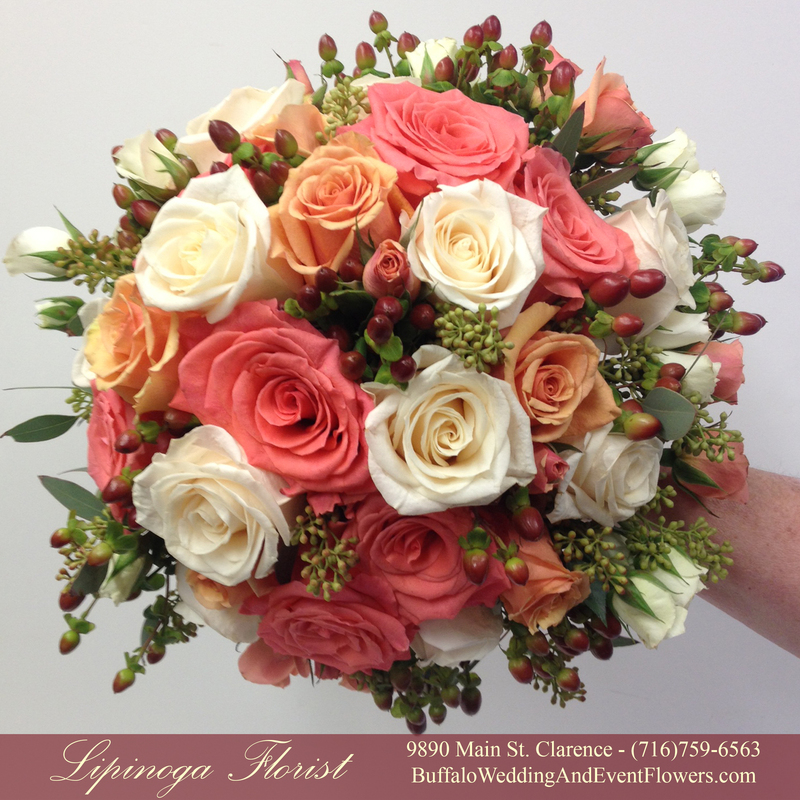 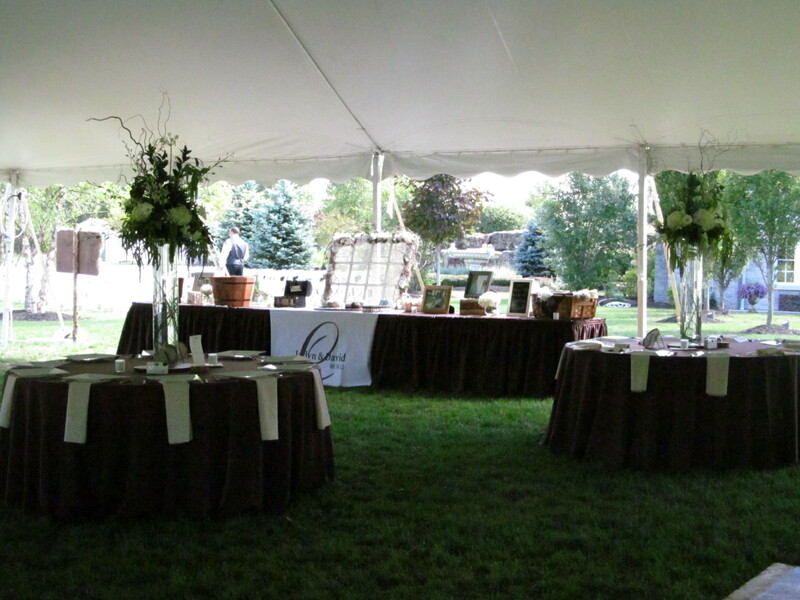 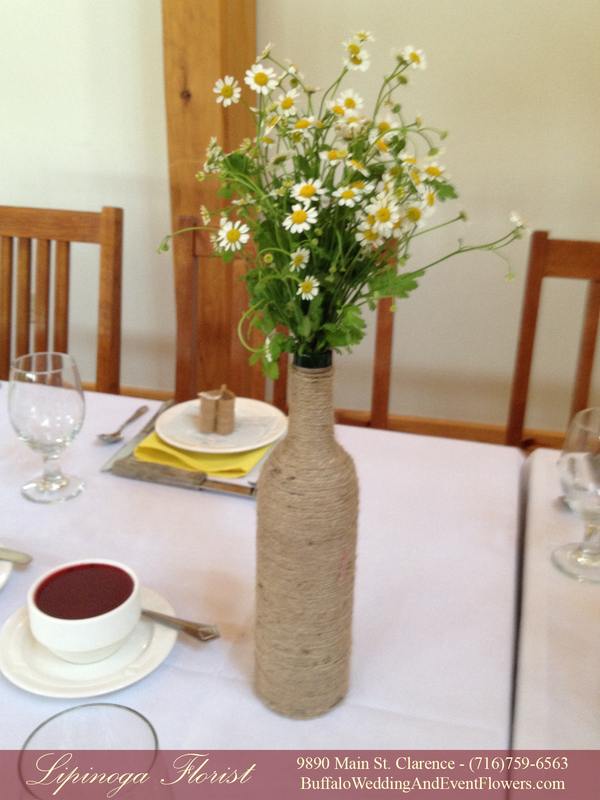 Lipinoga Florist designed floral arrangements for a rustic wedding held at a private residence in Clarence, NY. 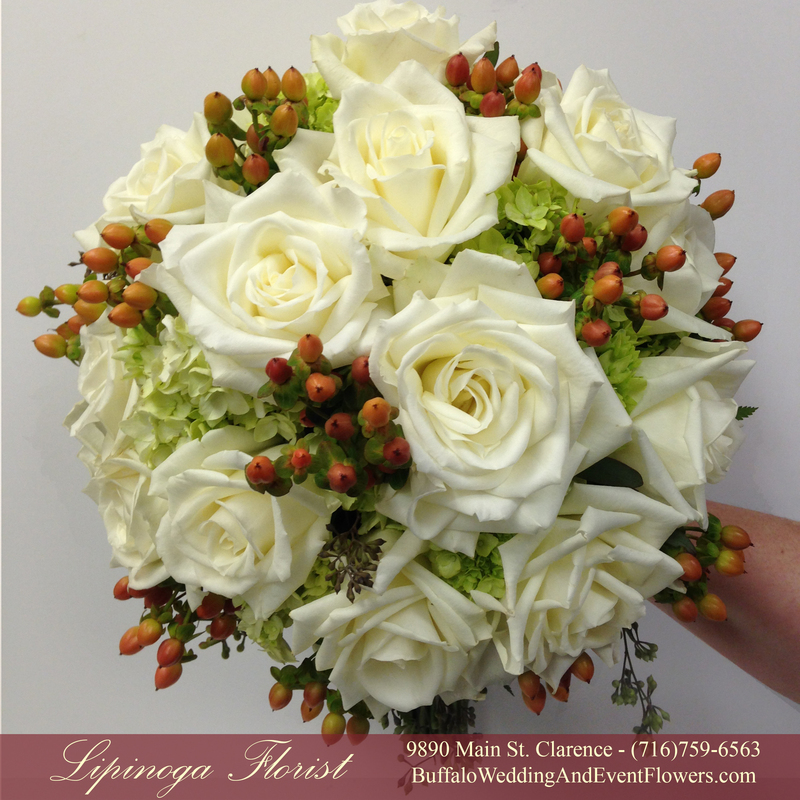 The bride carried a bouquet white bouquet including orchids, roses, and hydrangea accented by berries and greenery. 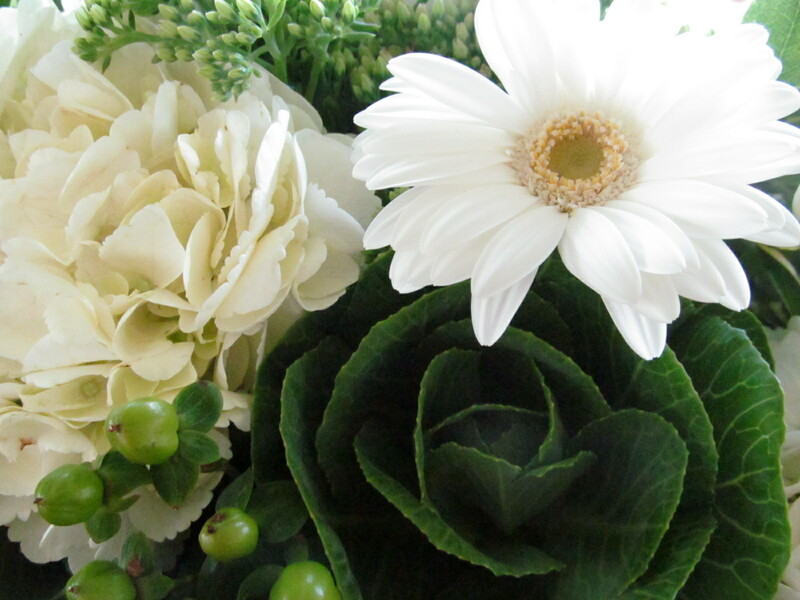 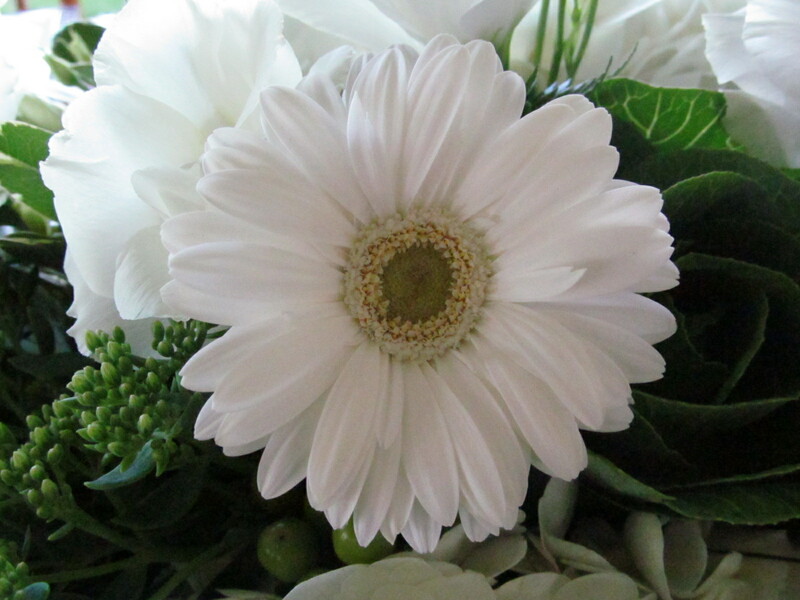 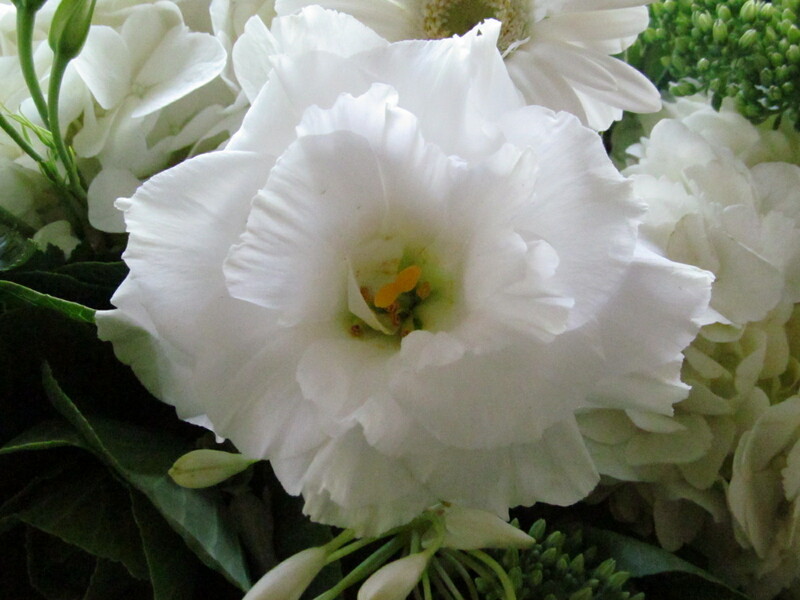 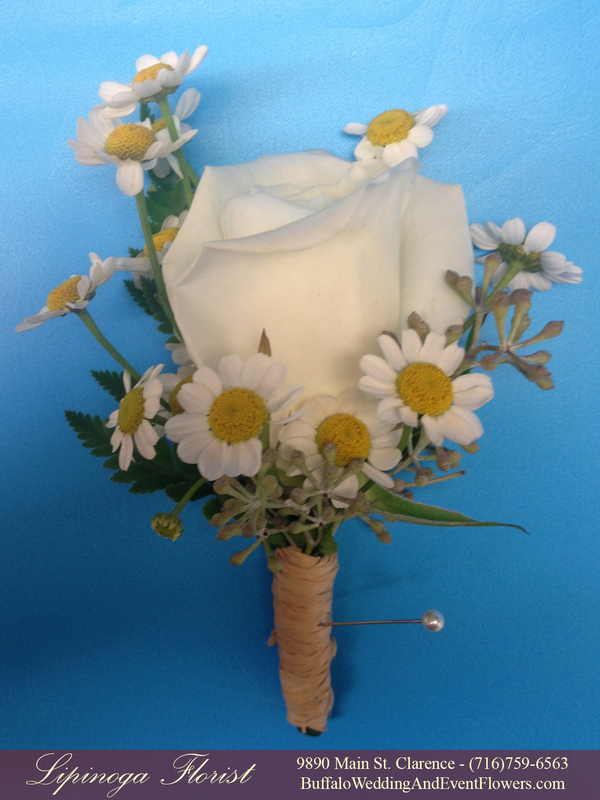 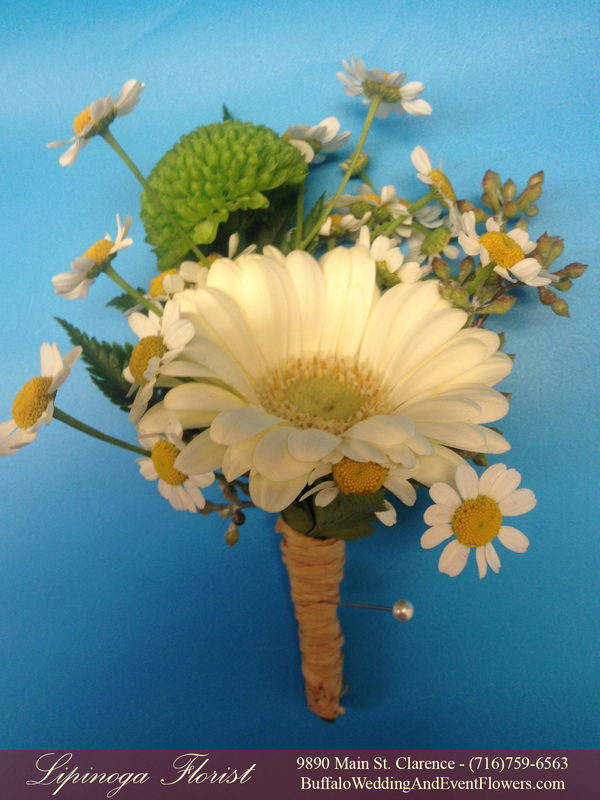 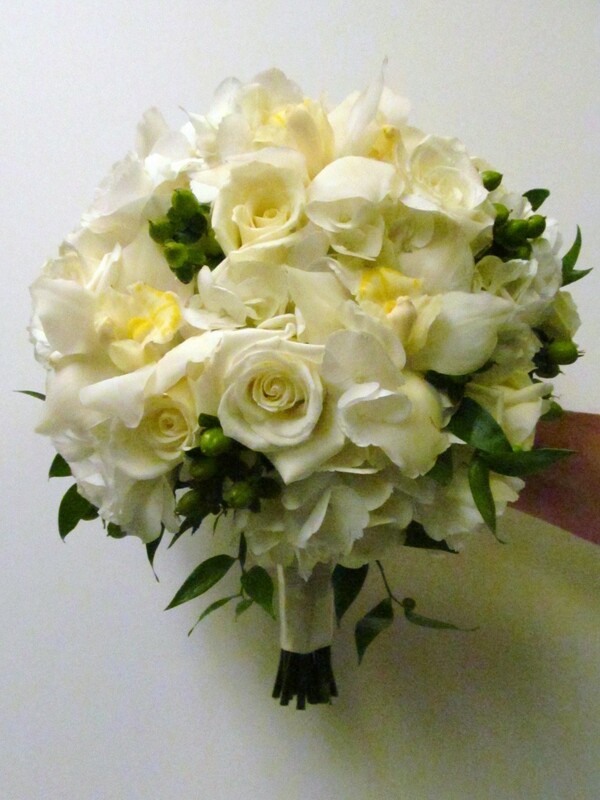 The bridesmaids carried a similar bouquet to the bride which included some white gerbera daisies. 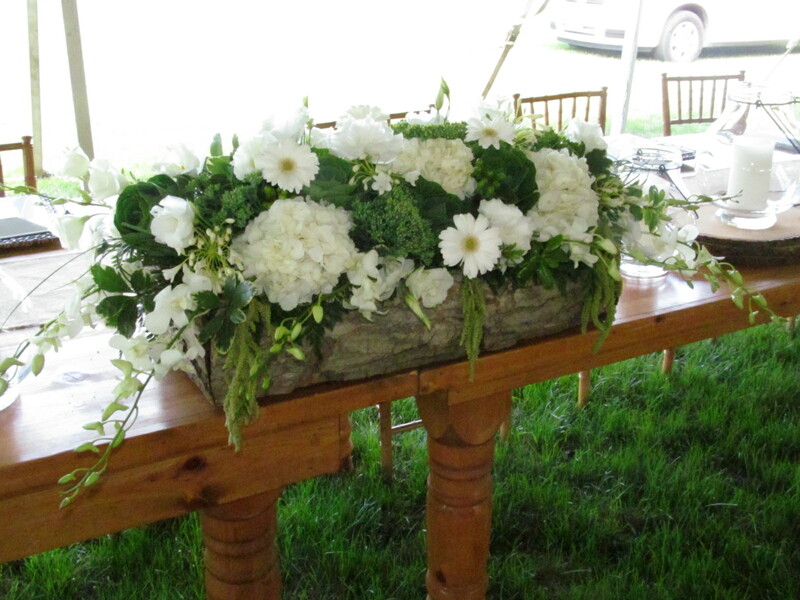 An assortment of green and white flowers overflowed a carved out log to create a gorgeous rustic centerpiece for the head table. 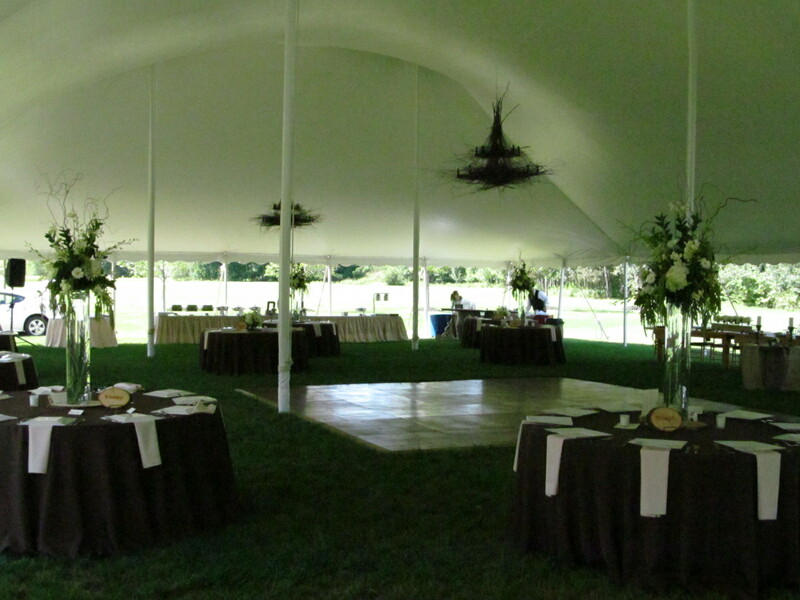 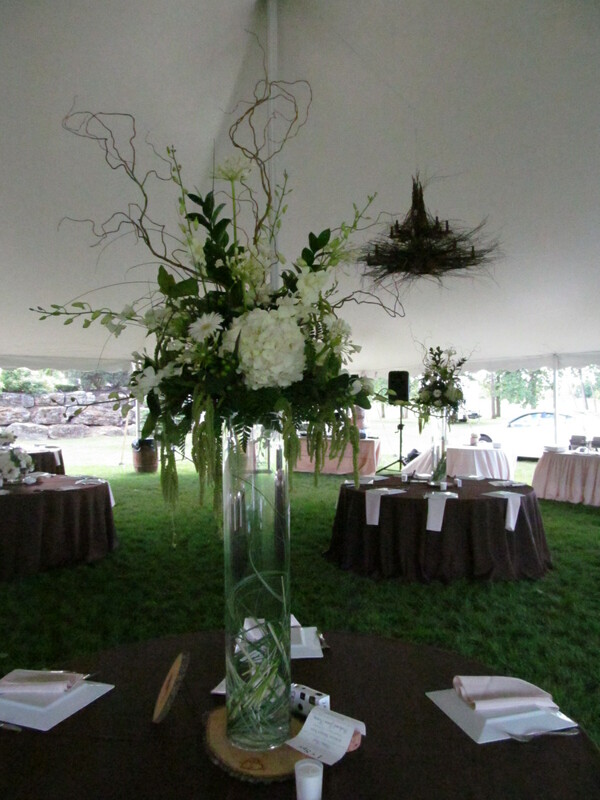 Tall centerpieces added to the rustic elegant ambiance of the tented reception. 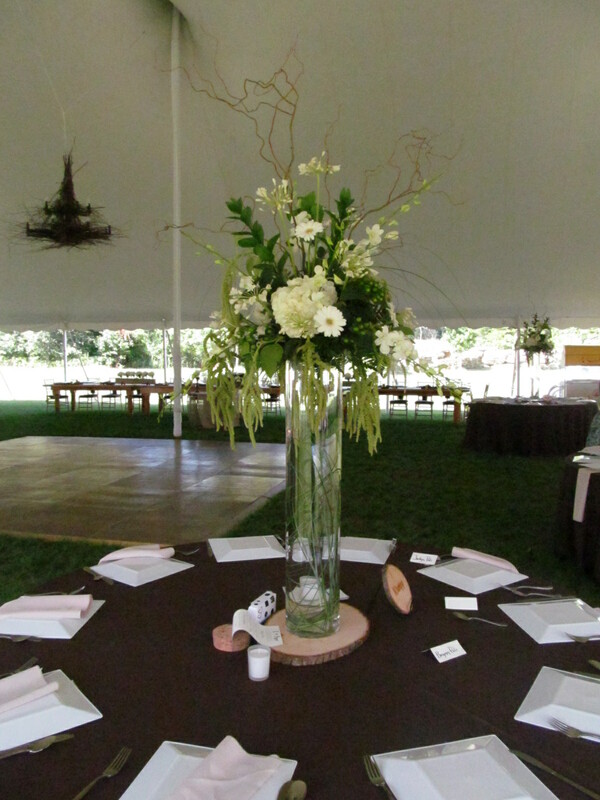 Low centerpieces in glass cubes tied with a chocolate brown bow rested on top of a real tree trunk slice. 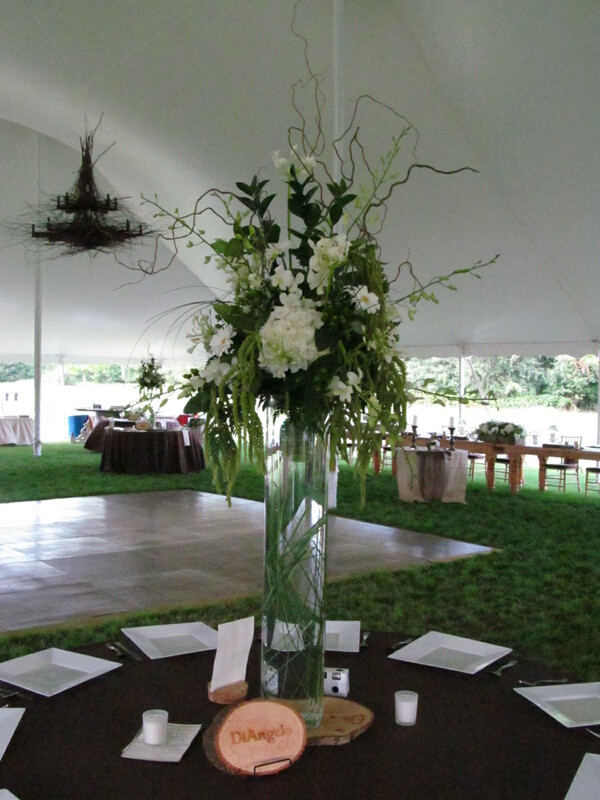 Tall centerpieces brought the decor up to eye level when you walked into the tent. 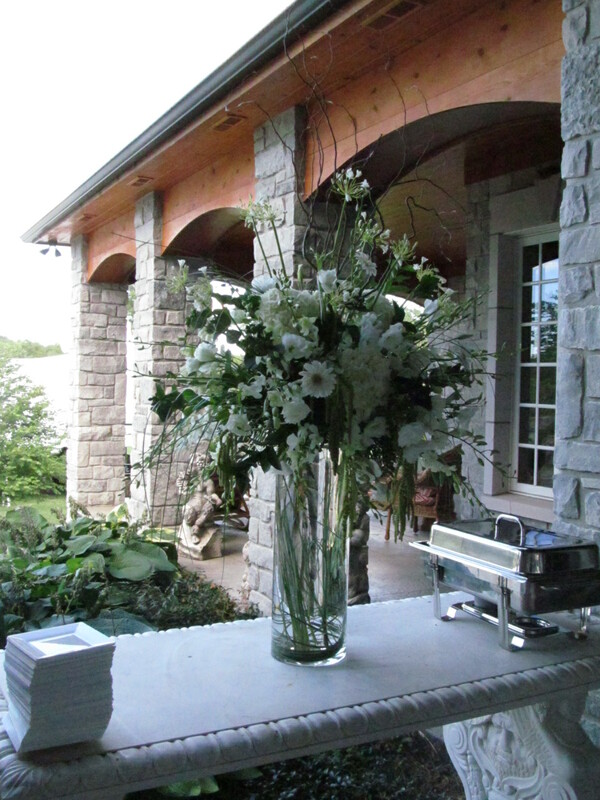 The cocktail hour on the terrace was graced with a stunning presentation of white blossoms. 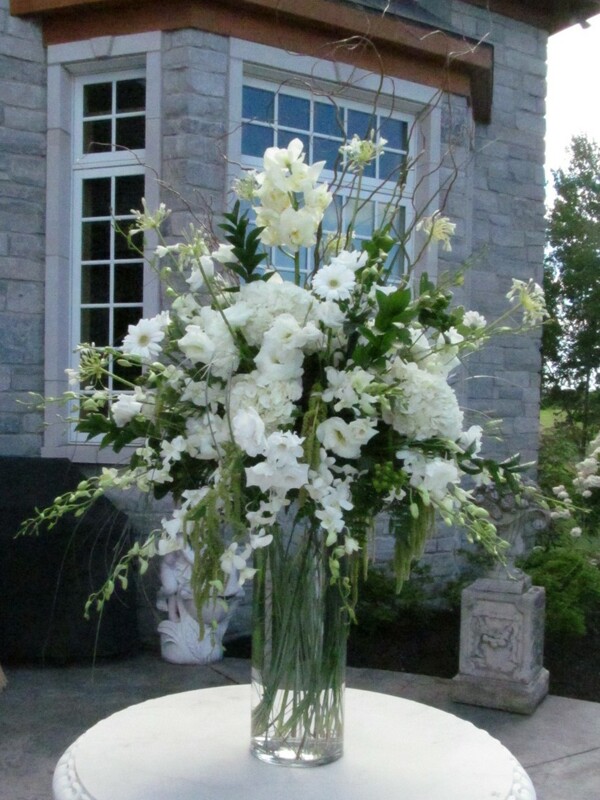 The cocktail hour featured bouquets on large cylinder vases full of white flowers such as hydrangea, gerberas, orchids and more. 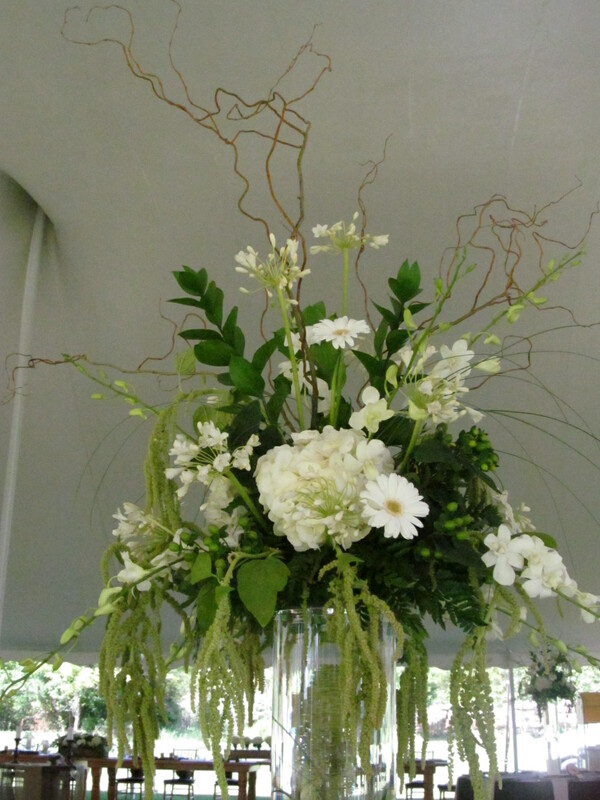 Tall centerpieces of white flowers and assorted greenery included tall branches to further increase the height and rustic feel of the display. 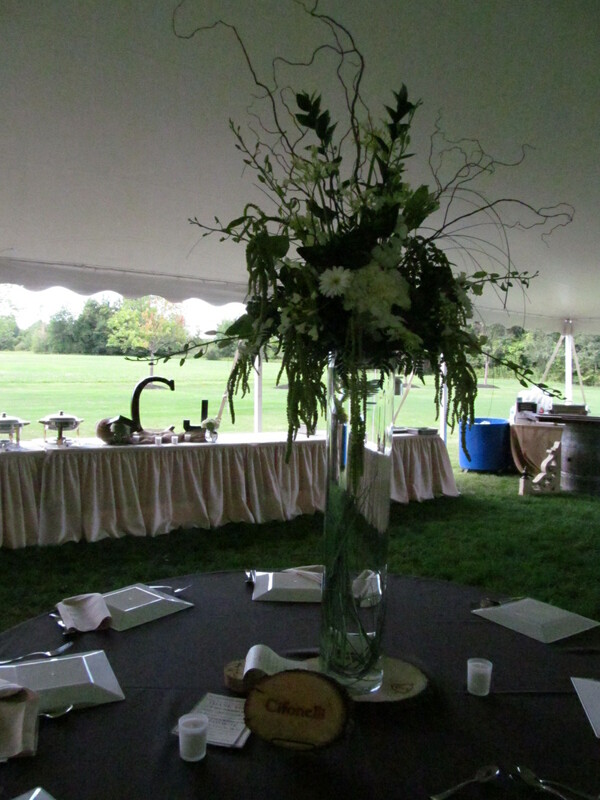 The tables alternated low and high centerpieces and included complementing flowers and greenery. 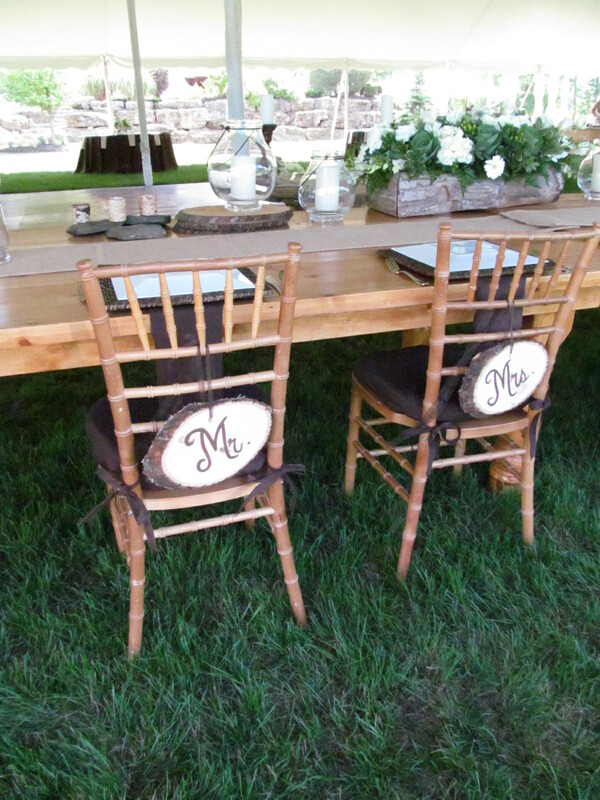 Rustic touched from wood, to twigs abounded in this casual elegant home wedding. 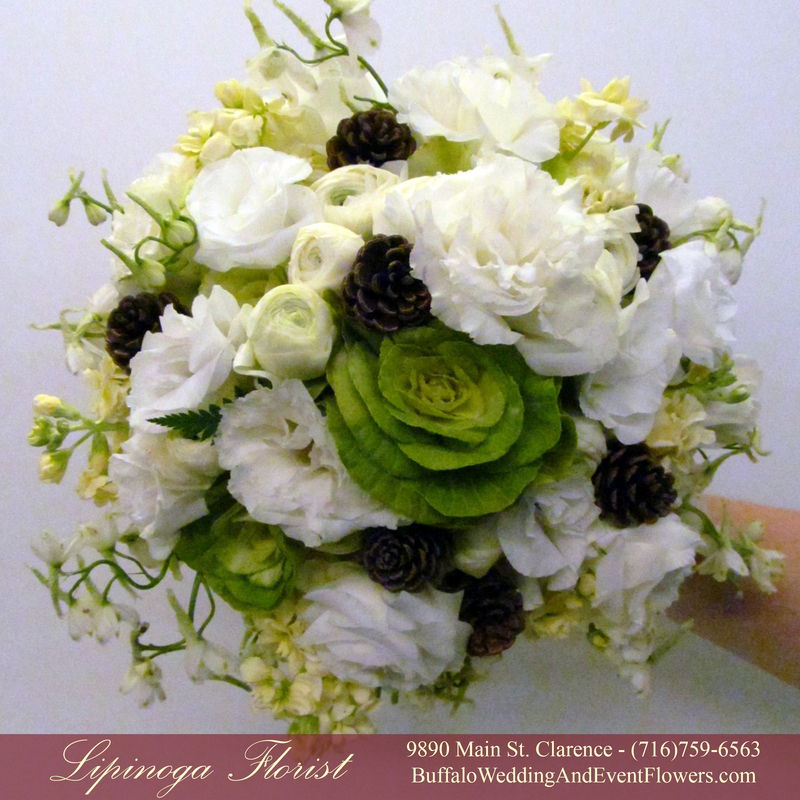 The bride carried a bouquet that was simply elegant yet casual, in keeping with the overall look and feel of the day. 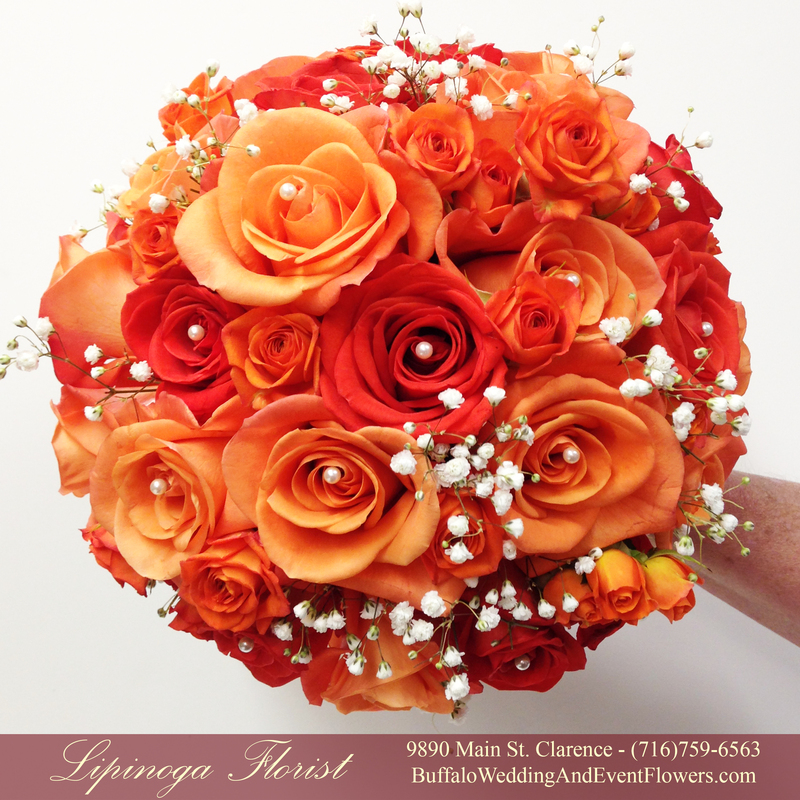 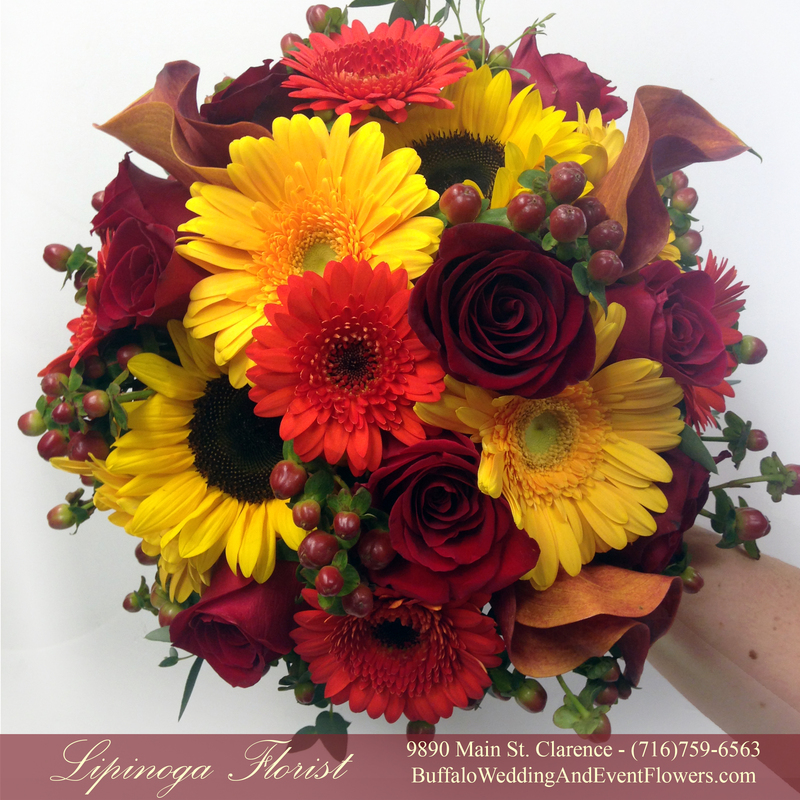 A beautiful fall wedding held at Brookfield Country Club in Clarence included a beautiful combination of red, yellow and orange hues. 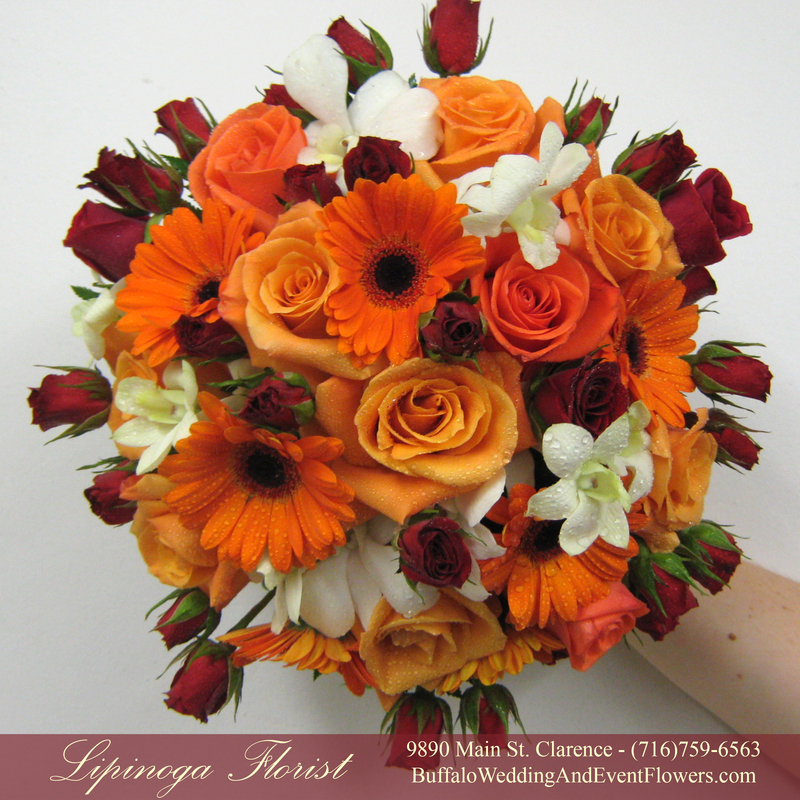 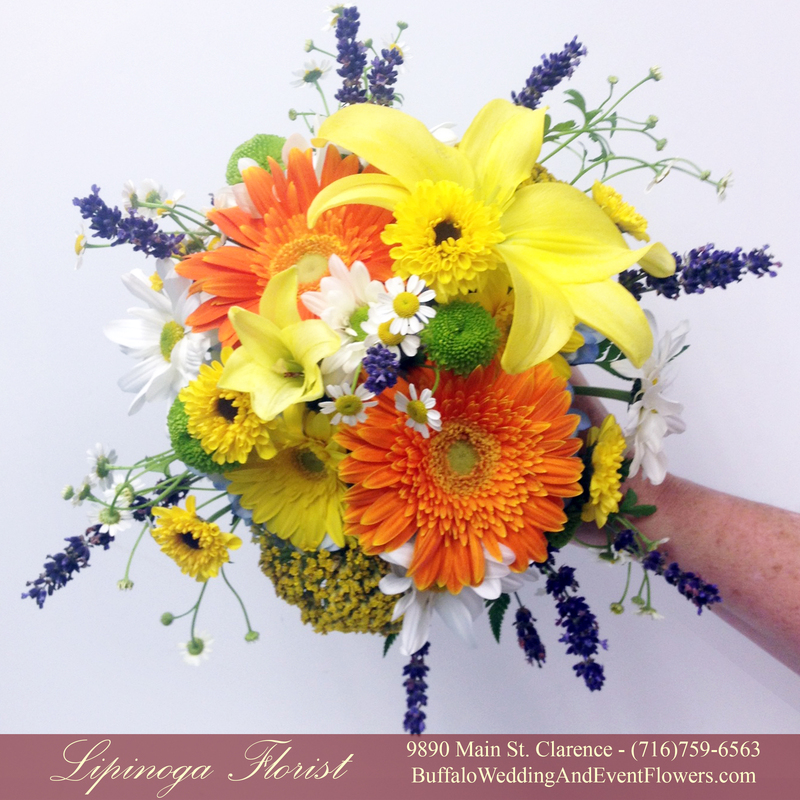 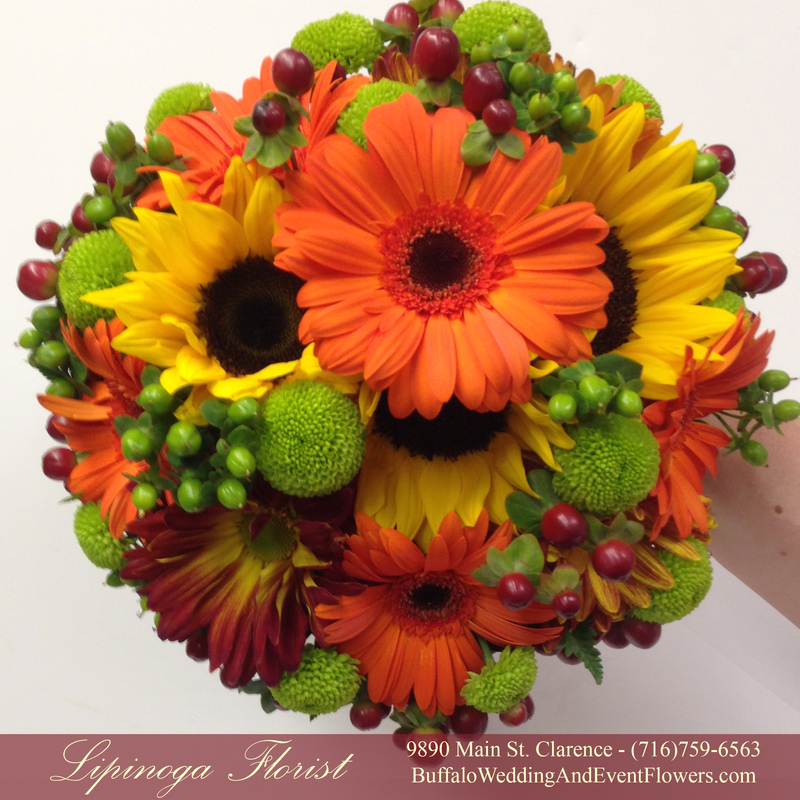 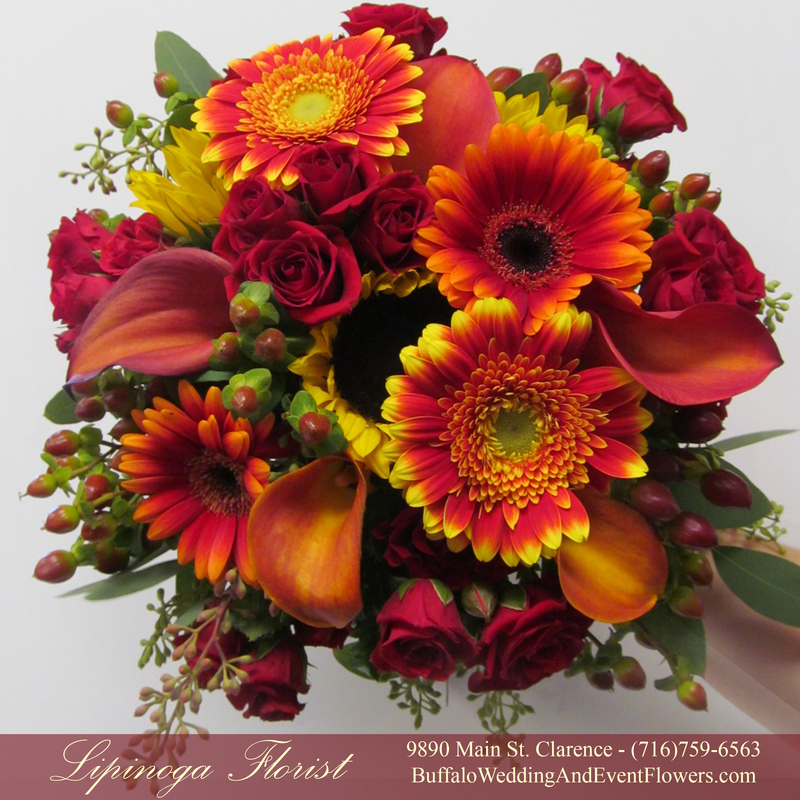 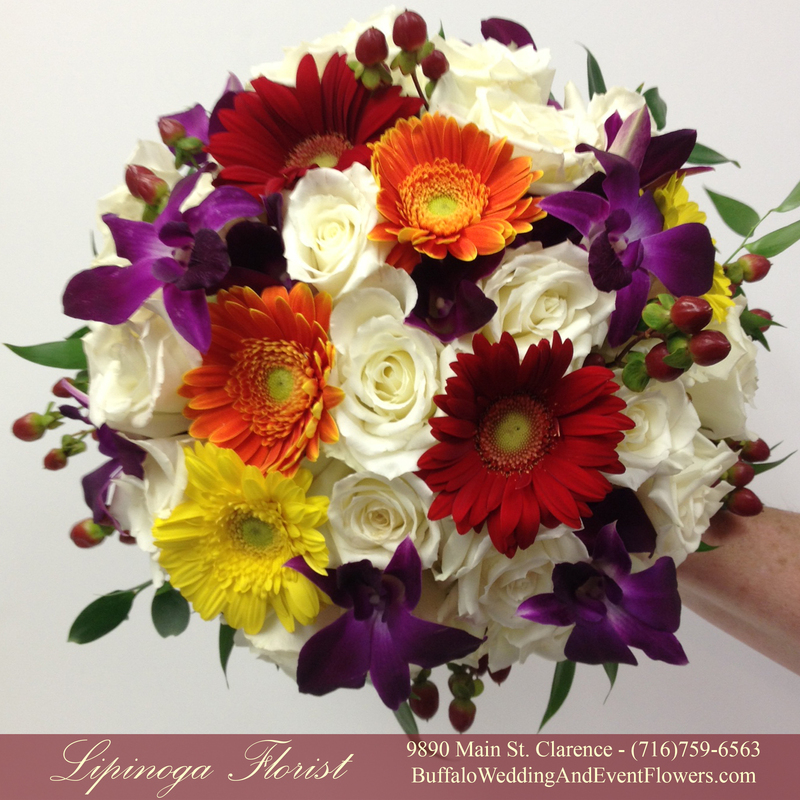 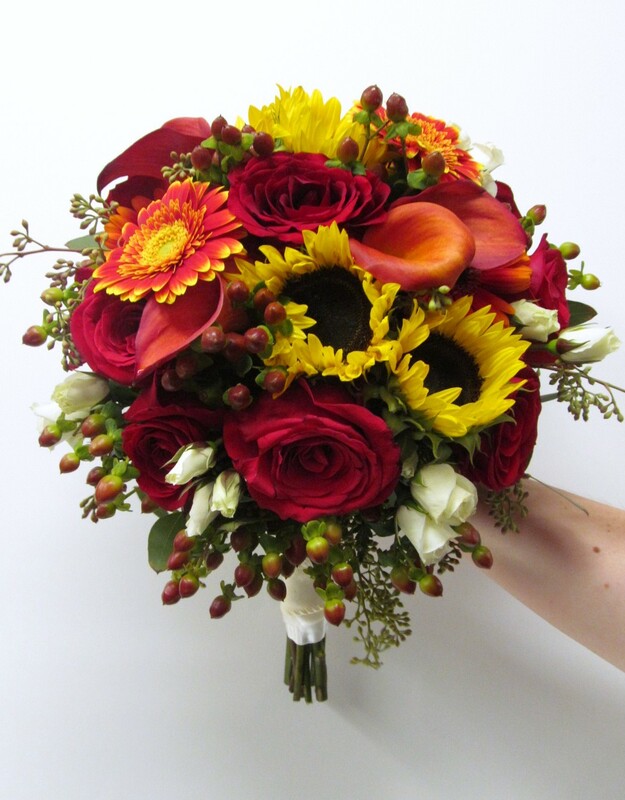 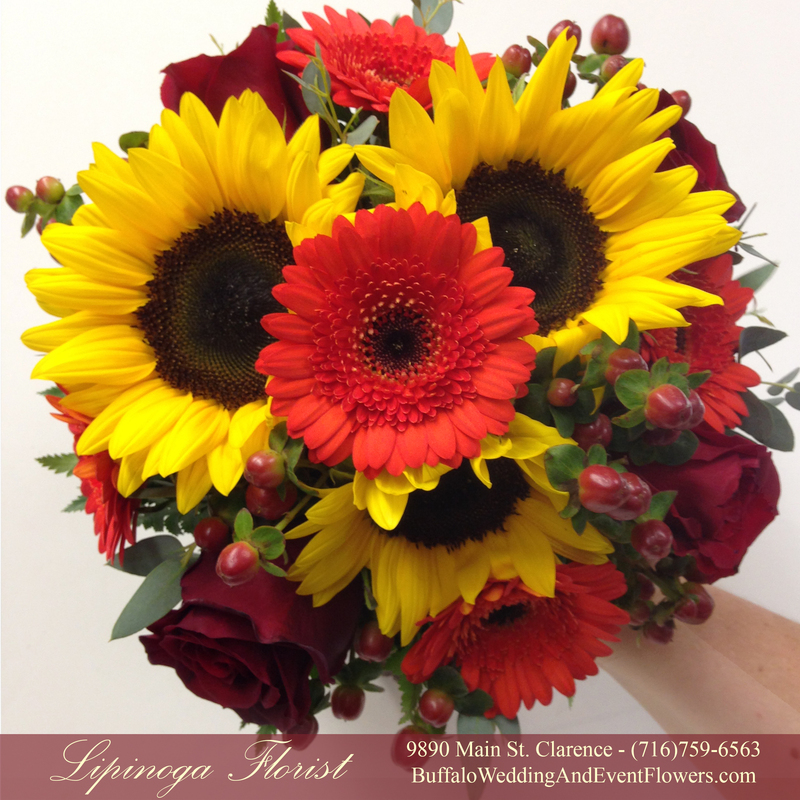 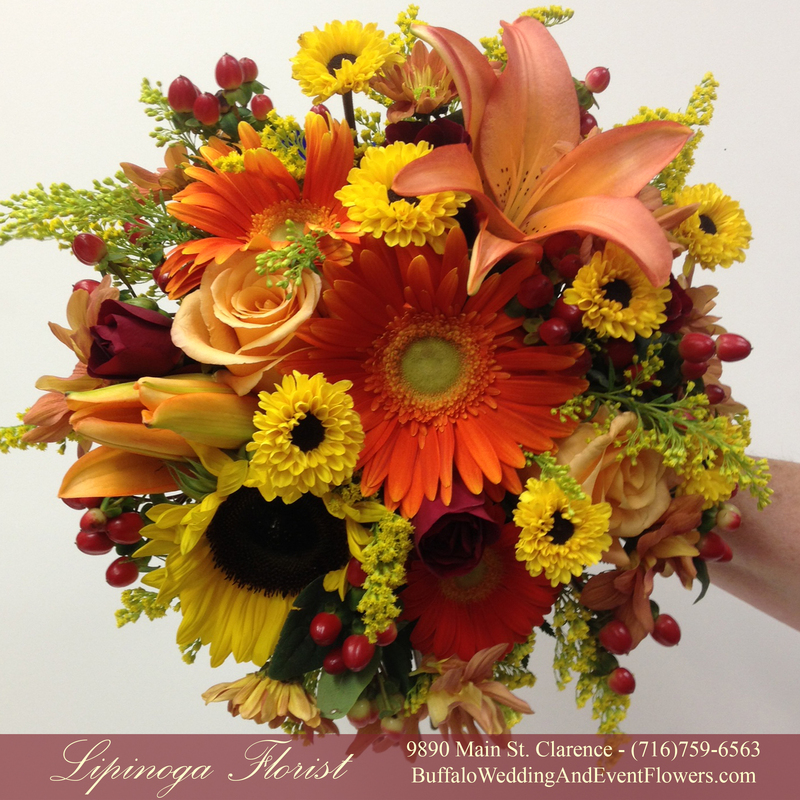 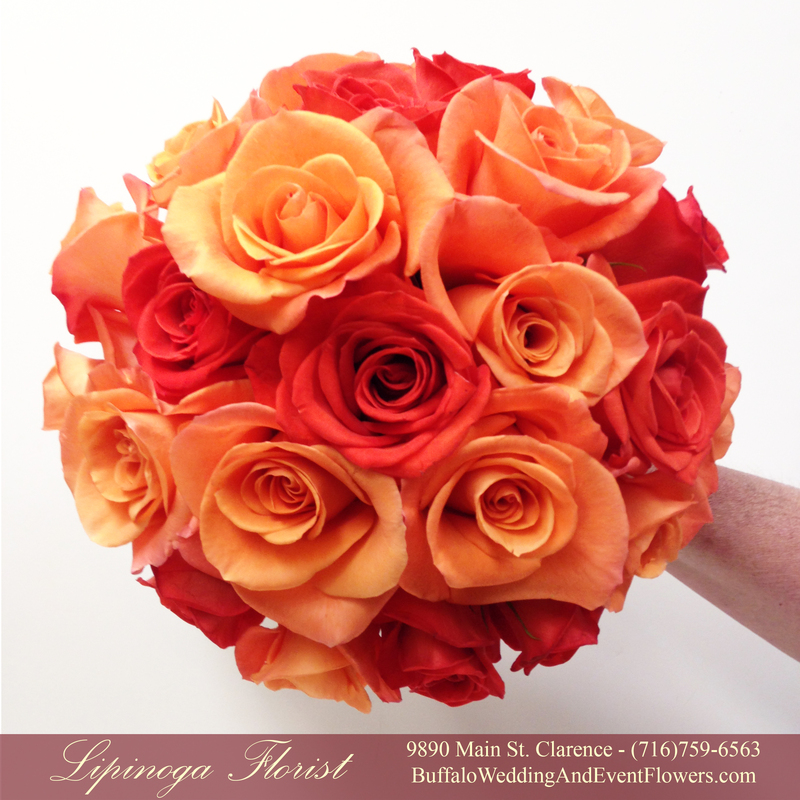 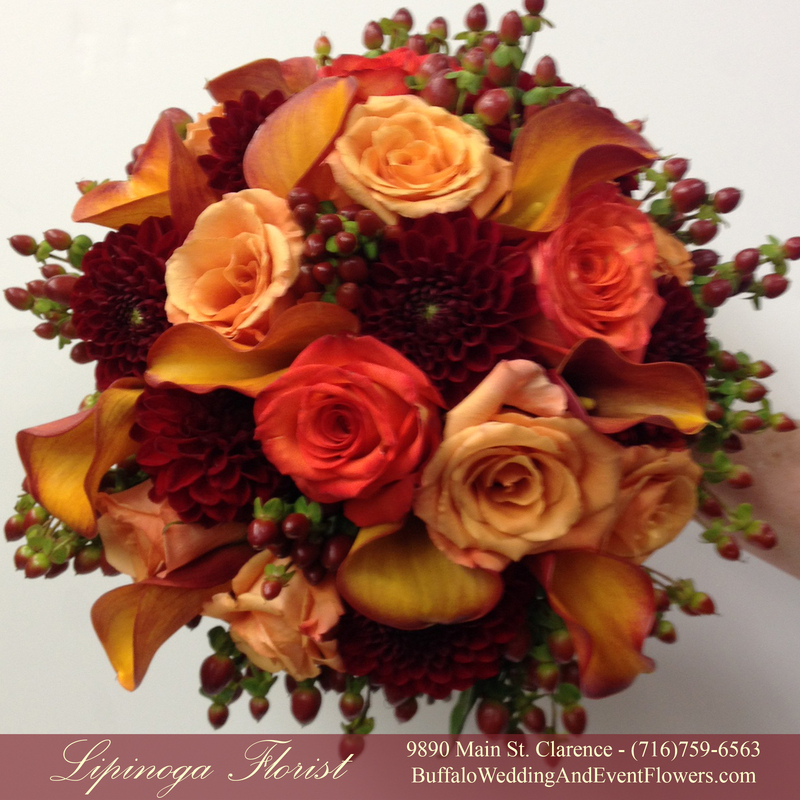 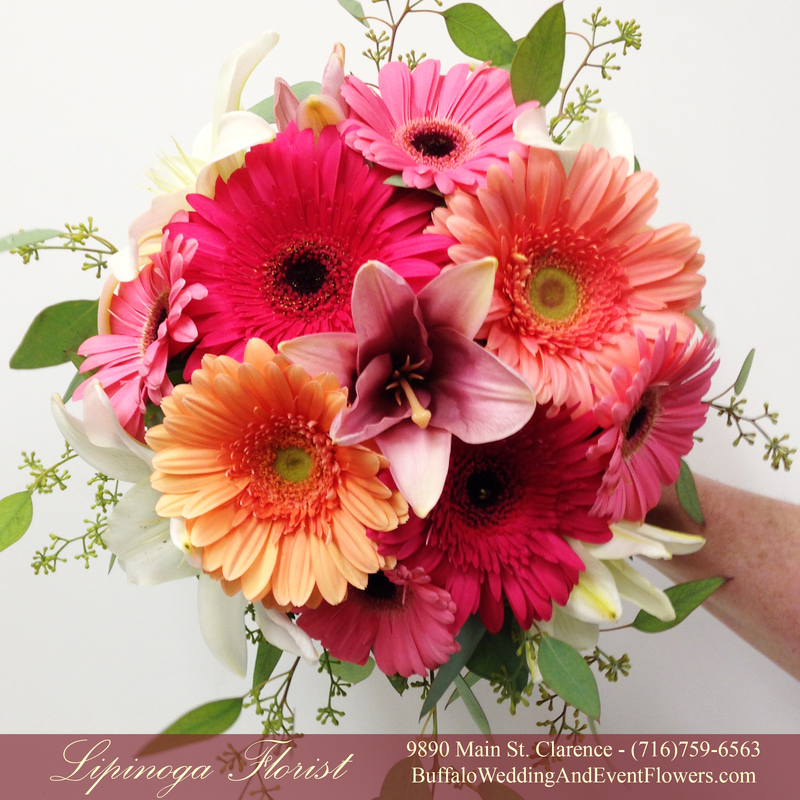 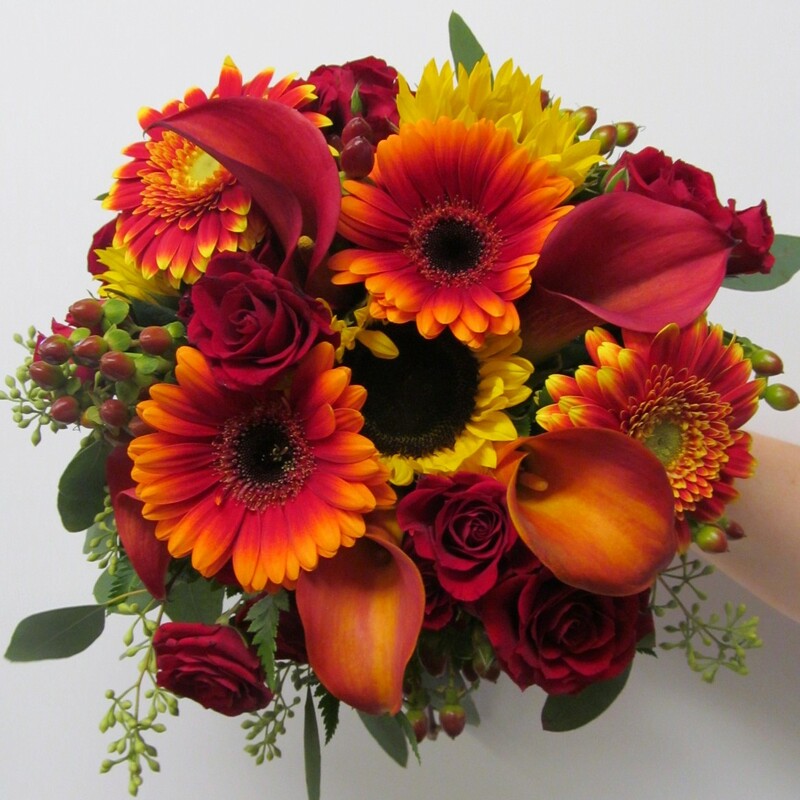 Lipinoga Florist designed bouquets for the bridesmaids including two-tone gerbera daisies, sunflowers, orange mini calla lilies and red spray roses accented by greenery and berries. 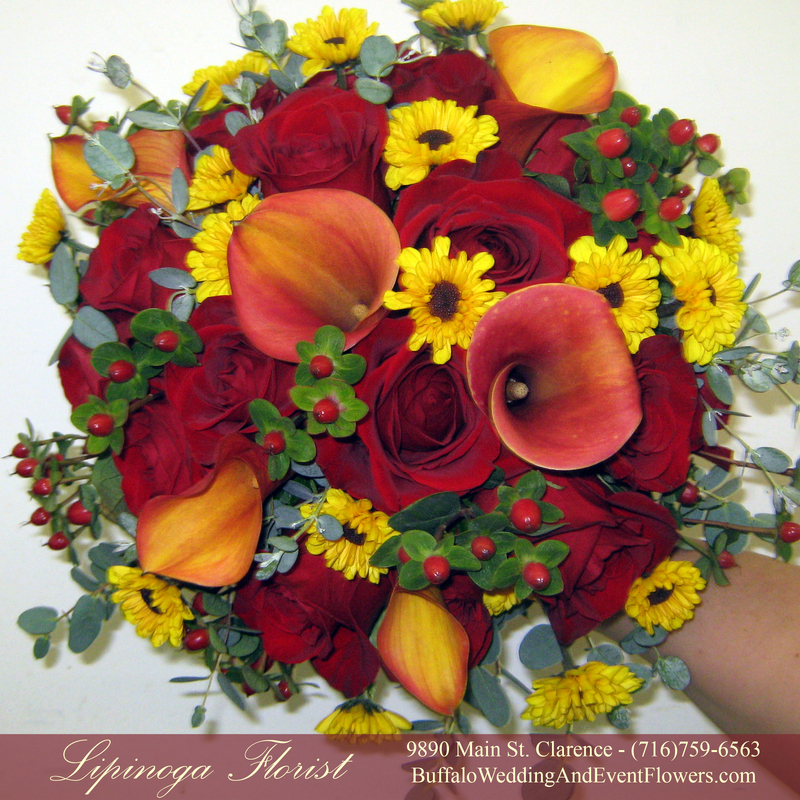 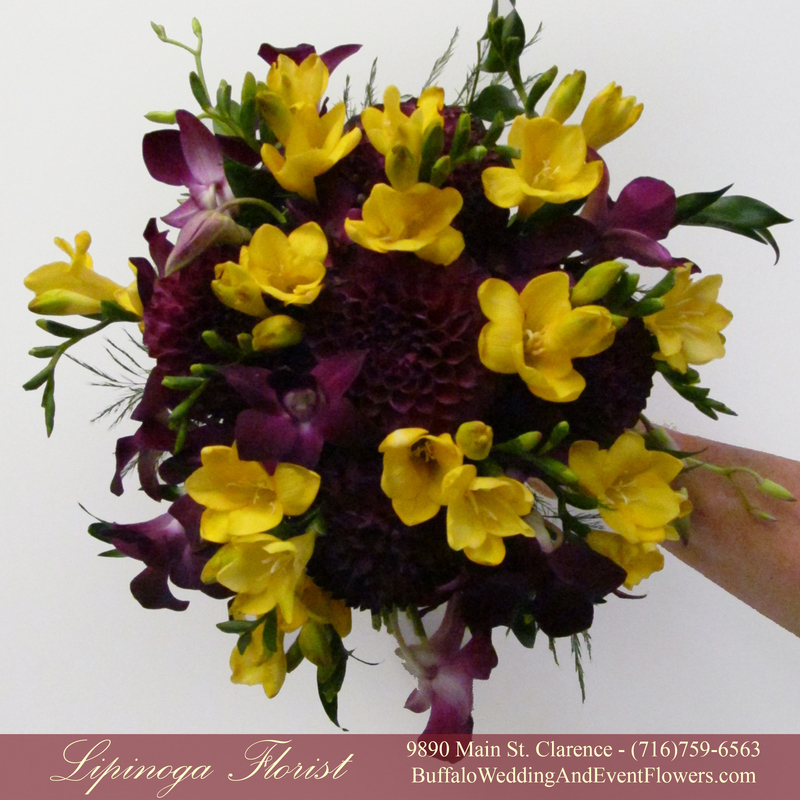 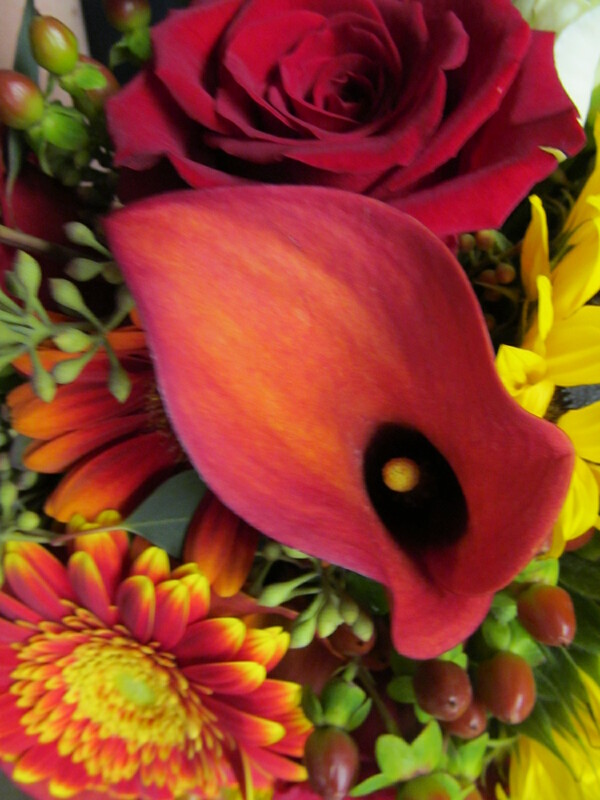 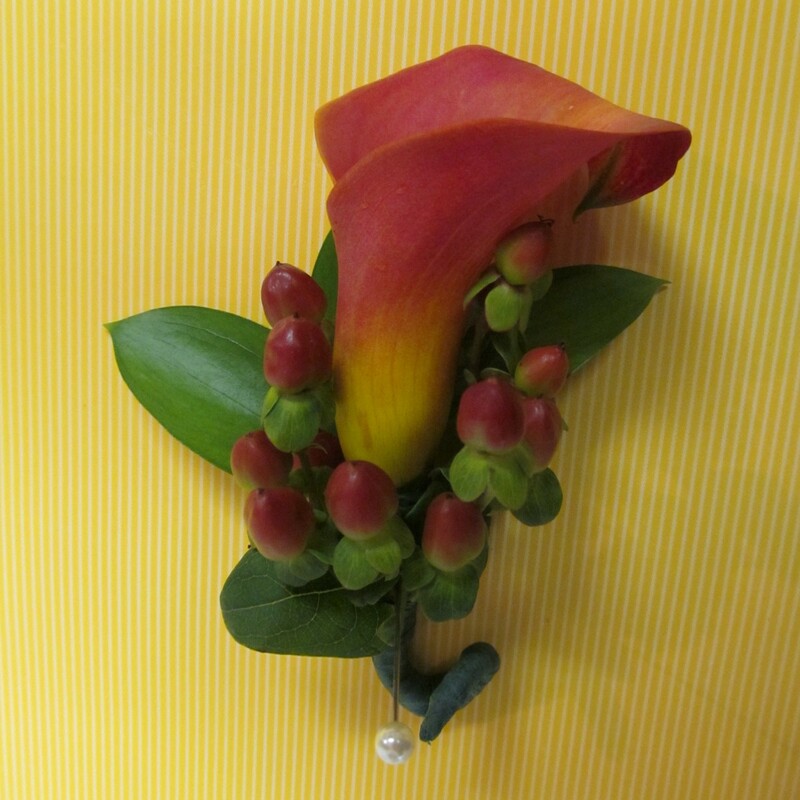 The groomsmen wore a simple mini calla lily accented by berries for an autumnal feel. 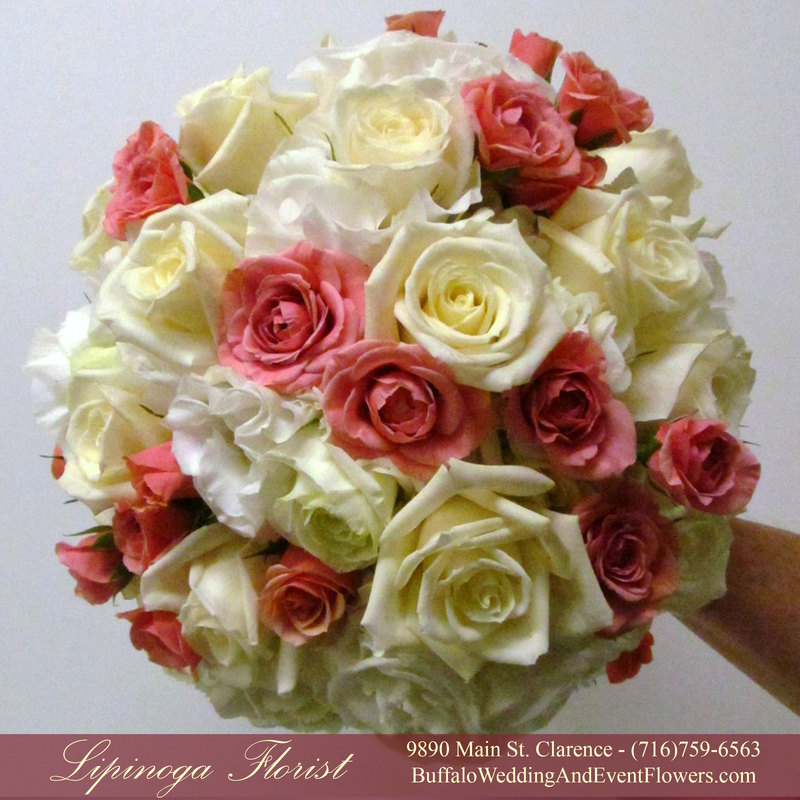 The bride carried a bouquet similar to the bridesmaids with large red roses and white spray roses. 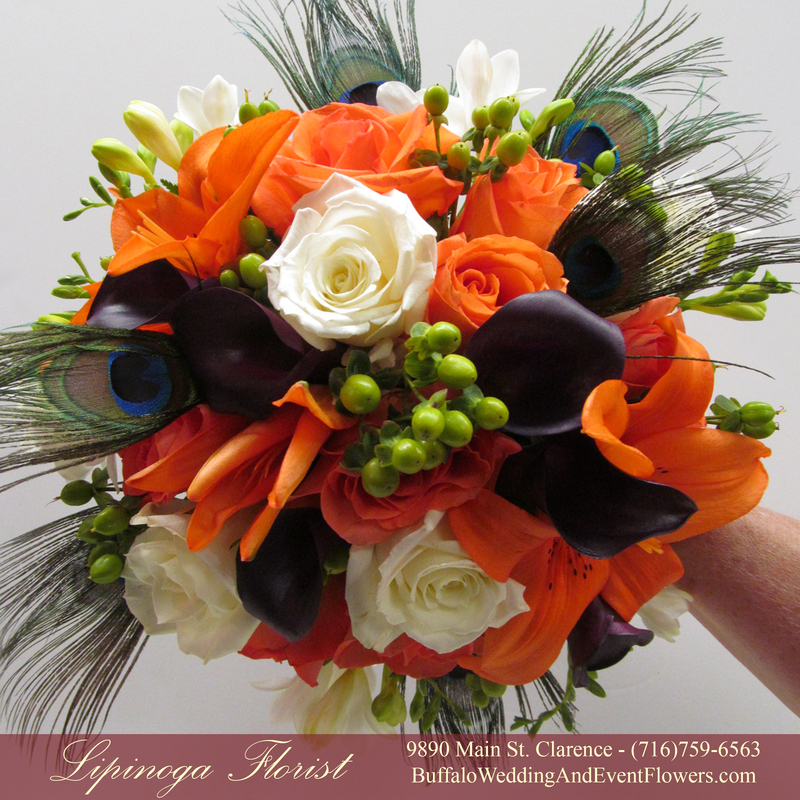 The mothers and grandmothers wore corsages of orange mini calla lilies and red roses accented by seeded eucalyptus and a soft chiffon ribbon. 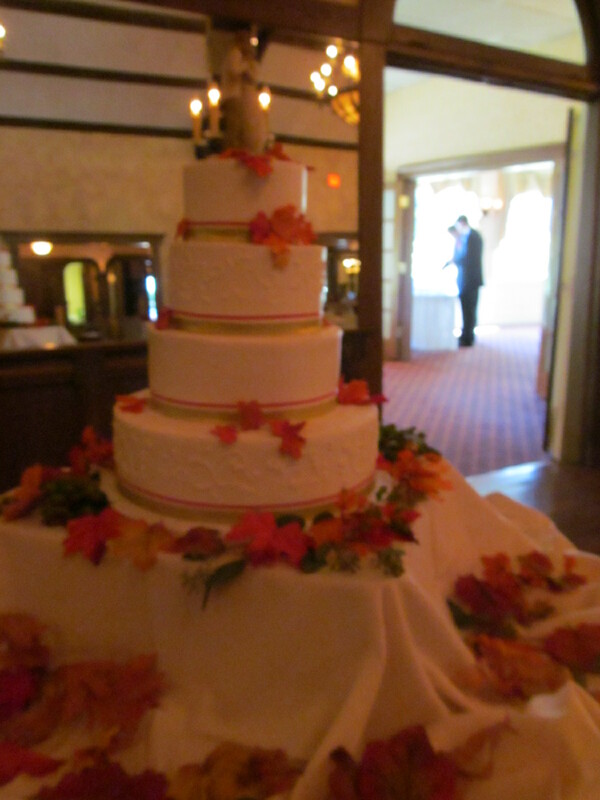 The cake was accented by fall leaves and some red berries and seeded eucalyptus. 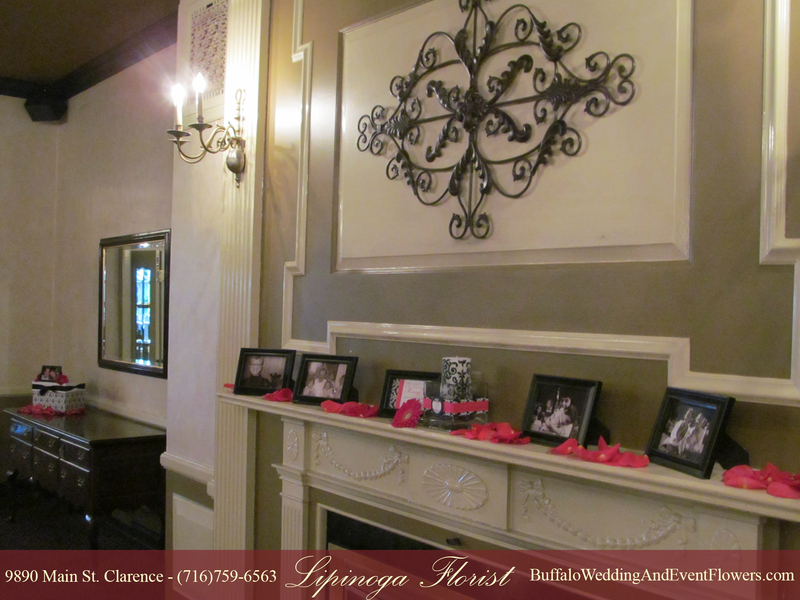 The ceremony was held in the Meadowbrook Room at Brookfield Country Club in Clarence, NY. 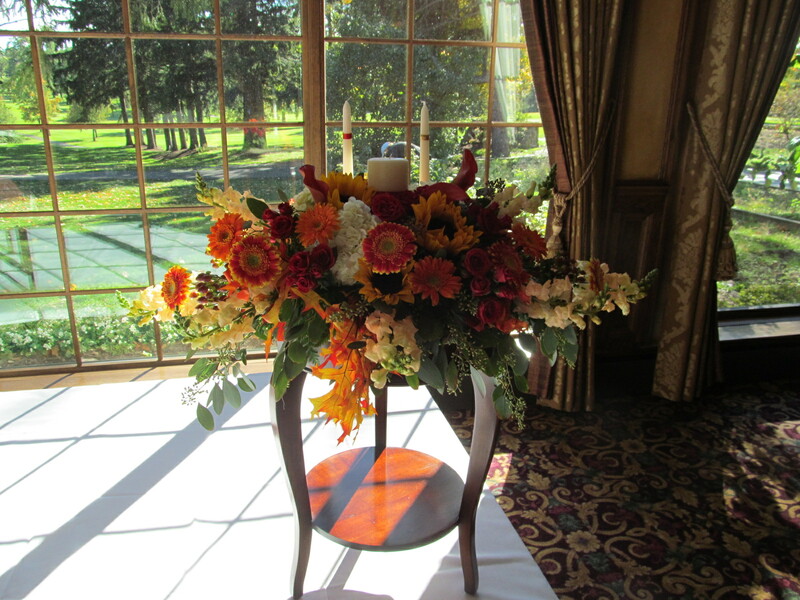 A beautiful long and low centerpiece incorporated the couple’s own unity candle adding a personal touch to the ceremony area.